Richardson RFPD, Inc. announced its attendance and participation at EDI CON 2017, including its sponsorships of the GaN Panel. Richardson RFPD Announces Global Agreement with Tagore Technology Inc. Under an agreement announced October 20, 2016, Richardson RFPD will distribute Tagore Technology Inc.’s portfolio of high-power RF switches to customers worldwide. Richardson RFPD Inc. announced a global agreement with Power Integrations, Inc. Under the terms of the agreement, Richardson RFPD will distribute Power Integrations’ SCALE™ IGBT drivers for the high-power market, as well as its new SCALE-iDriver™ integrated circuits, on a worldwide basis. Richardson RFPD Inc. announced the availability and full design support capabilities for a new passive switch from MACOM Technology Solutions Inc. The MADP-011048 uses silicon PIN diodes in a non-magnetic surface mount package. There are two sets of diode pairs, constructed in an electrically-isolated, anti-parallel configuration, that operate from 5 MHz to 400 MHz. Richardson RFPD Inc. announced the availability and full design support capabilities for a new gallium arsenide flip-chip hyperabrupt varactor diode from M/A-COM Technology Solutions. Richardson RFPD Inc. announced its participation in the 2016 IEEE International Microwave Symposium (IMS), to be held in San Francisco, Calif., May 24-26, 2016. The IMS2016 is the largest RF/microwave commercial exhibition in the world, with more than 600 exhibiting companies. It is held in conjunction with the IEEE RFIC and ARFTG conferences. Richardson RFPD has collaborated with Analog Devices (ADI) and New Edge Signal Solutions to develop digital front-end (DFE) radio solutions, including new wideband (6 to 24 GHz) SiGe up/down converters (ADRF6780, ADRF6880) and transceivers. The ADRF6780 and ADRF6880 enable simpler system architecture, especially for customers seeking to cover multiple bands from 6 to 24 GHz, by replacing narrow-band devices, using fewer components, offering higher system reliability, and using less board space. Richardson RFPD Inc. announced that its distribution of a large portfolio of serial digital interface (SDI) video and optoelectronics products from M/A-COM Technology Solutions has expanded into Europe. Richardson RFPD Inc. announces its attendance and participation at the 2016 IEEE MTT International Microwave Symposium (IMS), the premiere international gathering for all aspects of microwave theory and practice. The IMS2016 is the largest RF/Microwave commercial exhibition in the world, with more than 600 exhibiting companies. It is held in conjunction with the IEEE RFIC and ARFTG conferences. Richardson RFPD Inc. announced the availability and full design support capabilities for a selection of SDI video and optoelectronics products from M/A-COM Technology Solutions. Richardson RFPD Inc. announces its attendance and participation at EDI CON 2016, including its sponsorships of the GaN Panel and Small Cell Workshop. EDI CON is an industry-driven conference/exhibition targeting RF, microwave, EMC/EMI, and high-speed digital design engineers and system integrators developing products for today's communication, computing, RFID, wireless, navigation, aerospace and related markets. Richardson RFPD Inc. announced the availability from stock and full design support capabilities for a new dual-channel SiC MOSFET driver from Wolfspeed, a Cree Company. Richardson RFPD Inc. announced the availability and full design support capabilities for a selection of broadband surface mount directional couplers from Innovative Power Products Inc.
Richardson RFPD Inc. announced the availability and full design support capabilities for a range of Xinger® couplers for aerospace and defense applications from Anaren. Richardson RFPD Inc. announced the availability and full design support capabilities for a family of DOCSIS 3.1 active components from M/A-COM Technology Solutions. Richardson RFPD, Inc. announced the availability and full design support capabilities for the portfolio of high-performance analog products from M/A-COM Technology Solutions. Richardson RFPD Inc. announced today the availability and full design support capabilities for a new GaAs power amplifier from TriQuint/Qorvo. Richardson RFPD Inc. announced the availability and full design support capabilities for a new LDMOS integrated power amplifier from Freescale. Richardson RFPD Inc. announces its attendance and participation at the 2015 IEEE MTT International Microwave Symposium (IMS), the premiere international gathering for all aspects of microwave theory and practice. Richardson RFPD, Inc. announced the availability and full design support capabilities for a new RF single-pole four-throw switch from Peregrine Semiconductor Corp.
Richardson RFPD, Inc. announced the availability and full design support capabilities for Hittite Microwave products from Analog Devices, Inc. Customers will benefit from the complete solutions that address the performance, reliability, and time-to-market requirements of an ever-widening range of ADI applications. Richardson RFPD, Inc. announced the availability and full design support capabilities for two new GPS helix antennas from Maxtena, Inc.
Richardson RFPD, Inc. announced the availability and full design support capabilities for three new 650V non-punch-through (NPT) insulated-gate bipolar transistors (IGBTs) from Microsemi Corp..
Richardson RFPD, Inc. announced the availability and full design support capabilities for a new ultracapacitor cell from Maxwell Technologies. Richardson RFPD Inc. announced the availability and full design support capabilities for a new wideband, 6-bit digital attenuator from M/A-COM Technology Solutions. Richardson RFPD, Inc. announced the availability and full design support capabilities for a new RF single-pole four-throw (SP4T) switch from Peregrine Semiconductor Corp.
Arrow RF & Power, officially doing business as Richardson RFPD, announced the online availability of videos and downloadable files of the presentations that were given at its booth during the 2014 International Microwave Symposium (IMS) in Tampa, Fla.
Richardson RFPD Inc. announces immediate availability and full design support capabilities for a new 50 to 2700 MHz, 75 W, 5 V RF amplifier from M/A-COM Technology Solutions (MACOM). Richardson RFPD Inc. announces that it is accepting orders for two new solutions for simplifying next generation Doherty architecture. Richardson RFPD Inc. announces immediate availability and full design support capabilities for two new gallium nitride on silicon carbide (GaN on SiC) low noise amplifiers (LNA) from TriQuint. Richardson RFPD Inc. announces a new 2500 to 6000 MHz, 100 W solid state high power amplifier from Empower RF Systems Inc. (Empower). Richardson RFPD Inc. announces immediate availability and full design support capabilities for a new high frequency, high power, 7-bit digital step attenuator (DSA) from Peregrine Semiconductor Corp. (Peregrine). Richardson RFPD Inc. announced the launch of a new website resource focused exclusively on lab bench test components. Richardson RFPD Inc. announces immediate availability and full design support capabilities for a new 0.7 to 2.7 GHz, 10 W hybrid coupler from Wavelex. Richardson RFPD Inc. announces immediate availability and full design support capabilities for a new analog-to-digital converter (ADC) from Analog Devices Inc. (ADI). Richardson RFPD Inc. announces immediate availability and full design support capabilities for a new RF Agile Transceiver™ from Analog Devices Inc. (ADI). Richardson RFPD Inc. announced an expanded video selection in its award-winning online Design Resource Center. Richardson RFPD Inc. announces immediate availability and full design support capabilities for a new wideband DC block from Wavelex. Richardson RFPD Inc. announces immediate availability and full design support capabilities for a new absorptive 75 ohm RF single-pole, double-throw (SPDT) switch from Peregrine Semiconductor Corp. (Peregrine). Richardson RFPD Inc. announces availability and full design support capabilities for three new 650 V non-punch-through (NPT) insulated-gate bipolar transistors (IGBTs) from Microsemi Corp. (Microsemi). The new devices are the latest addition to Microsemi's family of 45 A to 95 A IGBTs. Richardson RFPD Inc. announces immediate availability and full design support capabilities for two new hybrid amplifiers for CATV applications from TriQuint. Richardson RFPD Inc. announces immediate availability and full design support capabilities for a new diffused metal oxide semiconductor (DMOS) transistor from STMicroelectronics (ST). Richardson RFPD Inc. announces that it is taking advance orders and offering full design support capabilities for a new family of 48 V gallium nitride-on-silicon (GaN-on-Si) RF power transistors from Nitronex. Richardson RFPD Inc. announces immediate availability and full design support capabilities for a new 14-bit analog-to-digital converter (ADC) from Analog Devices Inc. (ADI). The latest entry in Madden's blog on the Richardson RFPD website is titled, "Active Antenna Systems Reach the Tipping Point." The article covers how China Mobile is driving the industry to massive deployment of active antenna systems (AAS) solutions, as well as the application of simple AAS solutions in frequency-division duplexing (FDD) communications for crowded, urban areas. The article concludes with Mobile Experts' forecast of a 40 percent average market growth for AAS during the next five years. Richardson RFPD Inc. announces the availability of the industry's first 1Ω, 1700V Silicon Carbide (SiC) metal oxide semiconductor (MOSFET) from Cree Inc. (Cree). Richardson RFPD Inc. announces availability and full design support capabilities for two new high-frequency vertical diffusion metal oxide semiconductor (VDMOS) MOSFETs from Microsemi Corp. (Microsemi). Richardson RFPD Inc. announces immediate availability and full design support capabilities for a new ultra-wideband, SMA-connectorized Bias-T from Wavelex. Richardson RFPD Inc. announces availability and full design support capabilities for eleven new low loss, high density silicon carbide (SiC) MOSFET power modules from Microsemi Corporation (Microsemi). Richardson RFPD Inc. announces immediate availability and full design support capabilities for two new RF single-pole, double-throw (SPDT) switches from Peregrine Semiconductor Corp. (Peregrine). Richardson RFPD Inc. announces immediate availability and full design support capabilities for a new line of high power GaN transistors in rugged, space-saving plastic packages from MACOM Technology Solutions (MACOM). Richardson RFPD Inc. introduces a new 6-bit digital step attenuator from United Monolithic Semiconductors S.A.S. (UMS). The CHT4016-QEG operates from 4 to 14 GHz and provides an attenuation range of 31.5 dB in 0.5 dB steps. Richardson RFPD Inc. announces immediate availability and full design support capabilities for two new HaRP™ technology-enabled UltraCMOS® SP5T switches from Peregrine Semiconductor Corp. (Peregrine). Richardson RFPD Inc. and Wavelex announces immediate availability and full design support capabilities for two new low noise amplifiers (LNAs) from Wavelex. Richardson RFPD Inc. and Wavelex announced the launch of the Wavelex website. The new site offers the full portfolio of the company's RF, IF and microwave signal processing components for the RF and microwave industry. Richardson RFPD Inc. announces immediate availability and full design support capabilities for a new SiRFstarIV™ GPS module from Maestro Wireless. Richardson RFPD Inc. announces immediate availability of a new web resource for ultra-broadband and millimeter wave products from American Technical Ceramics Corp. (ATC). Richardson RFPD Inc. announces that it is taking orders for Xinger® III Femto Couplers, the newest addition to the Xinger® III family. Richardson RFPD Inc. announces immediate availability and full design support capabilities for a new 1 MSPS, ultralow power 12-bit successive approximation register analog-to-digital converter (SAR ADC) from Analog Devices Inc. (ADI). Richardson RFPD, Inc. today announced the online availability of videos of the presentations from the leading innovators and suppliers of RF, Wireless & Energy Technologies that the company hosted at its booth at the International Microwave Symposium (IMS) 2013 in Seattle. Richardson RFPD Inc. announced the debut of a new blog written by industry expert, Joe Madden. Richardson RFPD Inc. announced the debut of a new publication, IN FOCUS magazine. The first issue features machine-to-machine (M2M), reflecting the company's extensive commitment to the M2M market. Richardson RFPD Inc. announces the availability of the new Silicon Carbide (SiC) six-pack (three phase) power module from Cree Inc. (Cree). Richardson RFPD Inc. announces an exclusive IMS 2013 promotion featuring an RF Power Detector Kit from Analog Devices Inc. (ADI). Richardson RFPD Inc. announces four new DuNE™ technology-enhanced digitally tunable capacitors (DTCs) from Peregrine Semiconductor Corp. (Peregrine). Richardson RFPD Inc. announces availability and full design support capabilities for an omni-directional heavy-duty, fully IP67 waterproof external M2M antenna from Taoglas USA Inc. (Taoglas). Richardson RFPD Inc. announces its participation and schedule of presentations at the 2013 IEEE International Microwave Symposium (IMS), to be held in Seattle, Washington, June 2-7, 2013. Richardson RFPD Inc. announces availability of the latest Silicon Carbide (SiC) power MOSFET from Cree Inc. (Cree). The second-generation SiC Z-FET™ 1200V MOSFET C2M0080120D delivers industry-leading power density and switching efficiency, at half the cost-per-amp of Cree’s previous-generation MOSFETs. Richardson RFPD Inc. announces immediate availability and full design support capabilities for a new 200 W solid state, broadband, high power pallet amplifier featuring Freescale Semiconductor Inc. (Freescale) enhanced rugged LDMOS devices. Richardson RFPD Inc. announces immediate availability and full design support capabilities for a new Automotive Electronics Council (AEC) Q100-certified SPDT RF switch from Peregrine Semiconductor Corp. (Peregrine). Richardson RFPD Inc. announces its attendance and participation at the M2M Zone at CTIA Wireless 2013. Presented by CTIA – The Wireless Association®, CTIA is a large wireless communications conference and exhibition that includes service operators, retailers, distributors, application providers, and more. The M2M Zone Conference and Pavilion showcases those companies in the dynamic M2M (machine-to-machine) segment of wireless communications. Richardson RFPD Inc. announces immediate availability and full design support capabilities for a new evaluation kit for a 5W GaN MMIC power amplifier from Nitronex. Richardson RFPD Inc. announces its attendance and participation at the 25th International Exhibition for Telecommunications, Control Systems, IT and Communication Services—SVIAZ-Expocomm 2013. Sviaz-Expocomm is the largest international trade fair of communication products and services in Russia and Eastern Europe. Richardson RFPD Inc. introduces the AirPrime™ 4G LTE MiniCard (MC) Series from Sierra Wireless. Richardson RFPD Inc. announced the launch of a "smart filter" function on its website. The new smart filter allows users to quickly drill down through the nearly 100,000 semiconductors, systems and subsystems, M2M products, antennas, power supplies, interconnect and frequency control products, embedded solutions, passive devices, and electromechanical products using multiple search criteria. Richardson RFPD Inc. announces immediate availability and full design support capabilities for a new laterally diffused metal oxide semiconductor (LDMOS) transistor targeting land mobile radio from Freescale Semiconductor Inc.
Richardson RFPD Inc. announced that it has received a 2012 Boeing Performance Excellence Award. The Boeing Co. issues the award annually to recognize suppliers who have achieved superior performance. Richardson RFPD maintained a Silver composite performance rating for each month of the 12-month performance period. Richardson RFPD Inc. announces immediate availability and full design support capabilities for a new series of antennas from Linx Technologies (Linx). The tiny, low-cost MicroSplatch antennas represent a groundbreaking alternative to the high cost, long lead times, and limited frequency choices of chip antennas. Richardson RFPD Inc. introduces seven new high power switches from Skyworks Solutions Inc. (Skyworks). Richardson RFPD Inc. announces its attendance and participation at EDI CON 2013. EDI CON is an industry-driven conference/exhibition targeting RF, microwave, EMC/EMI, and high-speed digital design engineers and system integrators developing products for today's communication, computing, RFID, wireless, navigation, aerospace and related markets. Richardson RFPD Inc. announced the launch of a new website resource focused exclusively on Silicon carbide technology for energy and power applications. Richardson RFPD Inc. announced the launch of its M2M Tech Hub, a micro-website featuring the latest products and innovations from the world's leading M2M suppliers, along with extensive technical resources and tips, and online shopping. Richardson RFPD Inc. announces availability and full design support capabilities for a range of new, high efficiency, fourth generation antennas from Taoglas USA Inc. (Taoglas). Richardson RFPD Inc. announces immediate availability and full design support capabilities for a new CloudGate M2M gateway from Option. Richardson RFPD Inc. announced the launch of its Avionics & Radar Tech Hub, a micro-website featuring the latest news, innovations and new products related to avionics and radar applications. Richardson RFPD Inc. announced the launch of a new website resource focused exclusively on Gallium Nitride (GaN). Richardson RFPD Inc. announces its participation and the line-up of suppliers and products it will feature at IIC China 2013, to be held at the Shenzhen Convention & Exhibition Center, Shenzhen, China, February 28 to March 2, 2013. Richardson RFPD Inc. announced it has completed an agreement to distribute Silicon Carbide power products from Cree Inc. Under the agreement, Richardson RFPD will distribute Cree's SiC Schotty diodes, MOSFETs and power modules worldwide. Richardson RFPD Inc. announces its attendance and participation at the 2013 International IC China Conference & Exhibition (IIC-China). IIC-China is the country’s annual systems design event, now in its 18th year of bringing together engineers and technology vendors. Richardson RFPD Inc. announces its sponsorship of a special expert forum discussing the state-of-the-art in Gallium Nitride semiconductor technology targeting high-power RF and microwave applications. This forum will be held at EDI CON 2013 in the Beijing International Convention Center, Beijing, China, March 12-14, 2013. As the sponsor, Richardson RFPD has assembled a panel of experts from leading suppliers of discrete transistors and integrated circuits based on GaN technology. Richardson RFPD Inc. announces immediate availability and full design support capabilities for a pair of 35W Gallium Nitride (GaN) radio frequency power transistors from TriQuint Semiconductor Inc. (TriQuint). Richardson RFPD Inc. announces immediate availability and full design support capabilities for new package options on an RF power LDMOS transistor from Freescale Semiconductor Inc. (Freescale). Richardson RFPD Inc. announces immediate availability and full design support capabilities for two new GaAs hybrid amplifiers from ANADIGICS. The ACA2786 and ACA2788 each consist of two pairs of parallel amplifiers that are optimized for exceptionally low distortion and noise figure with input and output transient voltage protection. Richardson RFPD Inc. announces its attendance and participation at the 2012 Microwave Workshops & Exhibition (MWE). More than 400 microwave-related companies from around the world are scheduled to exhibit this year at MWE, which also features technical seminars and workshops. Richardson RFPD Inc. announces immediate availability and full design support capabilities for two new connector series from Carlisle Interconnect Technologies (Carlisle IT). The new series are extensions of Carlisle IT's push-on connector family. Richardson RFPD Inc. announced the immediate availability of its Small Cell (Femto, Micro, Pico) New Product Selector Guide. The October 2012 Small Cell Selector Guide includes the latest semiconductors, passive devices, and frequency control devices for this dynamic application. Richardson RFPD Inc. announces immediate availability and full design support capabilities for a new internally matched, low noise amplifier (LNA) in a small 2x2mm DFN package from TriQuint Semiconductor Inc. (TriQuint). Richardson RFPD Inc. announces immediate availability and full design support capabilities for three new devices from Freescale Semiconductor Inc. (Freescale). Richardson RFPD Inc. announces immediate availability and full design support capabilities of a new 30 W GaN power amplifier from TriQuint Semiconductor Inc. (TriQuint). Richardson RFPD Inc. announced the launch of its redesigned website homepage. The refreshed homepage design offers more direct, one-click access to Richardson RFPD's extensive portfolio of products and industry-leading suppliers, best-in-class design support, and purchase options. Richardson RFPD Inc. announced that strong demand has propelled sales of Fractus, S.A. (Fractus) antennas to more than 15 million units shipped worldwide. Richardson RFPD Inc. announced the launch of the TriQuint GaN Tech Hub, a micro-website featuring the latest news on gallium nitride (GaN) innovations and product releases from TriQuint Semiconductor, Inc.
Richardson RFPD Inc. announces immediate availability and full design support capabilities for a new RF switch from Peregrine Semiconductor Corp. The PE42430 switch was developed on Peregrine's patented UltraCMOS® technology and combines low insertion loss with high linearity, high isolation, and small package size, making it well suited for WLAN and Bluetooth® applications in the 2.4 GHz band, as well as general broadband switching applications. Richardson RFPD Inc. introduces three new low noise amplifiers (LNAs) that are available from stock for prototype or high-volume production from Skyworks Solutions Inc. (Skyworks). Richardson RFPD Inc. announced that it has been named one of the Top 3 Best Technical Support Distributors in China in the prestigious Electronic Components Distributor Survey, sponsored by Electronics Supply & Manufacturing-China (ESM-China), an electronics management publication by Global Sources (NASDAQ: GS) joint venture, eMedia Asia Limited. Richardson RFPD Inc. announced the online availability of videos of the presentations and Q&A sessions with the leading innovators and suppliers of RF, Wireless & Energy Technologies that the company hosted at its booth at the International Microwave Symposium (IMS) 2012 in Montréal. Richardson RFPD Inc. announces immediate availability and full design support capabilities for two new laterally diffused metal oxide semiconductor (LDMOS) transistors from Freescale Semiconductor Inc. (Freescale). Richardson RFPD Inc. announces immediate availability and full design support capabilities for a new family of gallium nitride (GaN) on silicon carbide (SiC), high electron mobility transistor (HEMT), radio frequency (RF) transistors from Microsemi Corp. (Microsemi). Richardson RFPD Inc. announces immediate availability of prototype reels of 600 Series capacitors from American Technical Ceramics Corp. (ATC). Richardson RFPD Inc. announces immediate availability and full design support capabilities for two new high power Tx/Rx switches from M/A-COM Technology Solutions Inc. (M/A-COM Tech). Both devices are well-suited for high power LTE, TD-SCDMA, WiMAX, and military radio applications, and are offered in compact, surface mount 4mm PQFN Packages. Richardson RFPD Inc. announces its participation and schedule of presentations at the 2012 IEEE International Microwave Symposium (IMS), to be held in Montréal, Canada, June 19-21, 2012. Richardson RFPD Inc. announced its participation and schedule of presentations at the 2012 IEEE International Microwave Symposium (IMS), to be held in Montréal, Canada, June 19-21, 2012. Richardson RFPD Inc. announces immediate availability and full design support capabilities for a pair of new InGaP HBT amplifiers from Freescale Semiconductor, Inc. optimized for wireless infrastructure applications. Richardson RFPD Inc. announces immediate availability and full design support capabilities for a new digital-to-analog converter (DAC) from Analog Devices Inc. (ADI). The AD5780 is a true 18-bit, unbuffered voltage output DAC that operates from a bipolar supply of up to 33 V, offers a relative accuracy specification of ±1 LSB maximum range, and guarantees monotonic operation with a ±1 LSB DNL maximum range specification. Teledyne Relays Europe announces the expansion of the role of Richardson RFPD as a Pan-European distributor of Teledyne Relays and Teledyne Coax Switches products. Richardson RFPD, a distributor for specialised products, brings the technical and applications support to the market needed by customers for Teledyne products. Richardson RFPD Inc. announces its attendance and participation at International CTIA Wireless 2012. International CTIA Wireless 2012 is the premier marketplace for wireless, telecom and broadband, as well as the key vertical markets that have entered into wireless. Richardson RFPD Inc. announces it has completed a distribution agreement with PriaTherm, a European-based provider of reliable and innovative solutions in the thermal management industry. With this agreement, Priatherm provides Richardson RFPD with a source to assist its European customers with fabricated heat sinks for high power RF, as well as energy and power management, applications. Richardson RFPD will host a broad line of experts from their supplier base that will make short presentations in their IMS/MTT-S Booth #1818. See their line up experts and presentation descriptions. Richardson RFPD Inc. announces immediate availability and full design support capabilities for eight devices representing the new gallium nitride (GaN) on Silicon Carbide (SiC) family of power transistors from M/A-COM Technology Solutions Inc. This product family targets L- and S-Band applications from 960 to 3500 MHz and reinforces M/A-COM Tech's rich heritage of leadership in power hybrid technology. Richardson Electronics Ltd., a global provider of engineered and distributed solutions for the RF, microwave and display markets, announces the hiring of Daniel S. Nickolai as vice president of manufacturing. Nickolai will be responsible for strengthening Richardson Electronics’ manufacturing capabilities and positioning the company for future growth. Richardson RFPD Inc. announces immediate availability and full design support capabilities for a pair of new converters from Analog Devices Inc. The devices are the latest additions to ADI's broad range of digital-to-analog (DAC) and analog-to-digital (ADC) converters that meet every data conversion challenge and application, and cover every specification, including accuracy, resolution, sample rate, bandwidth, power, size and value. Richardson RFPD Inc. announces that, effective immediately, its domain name will change to richardsonrfpd.com. Richardson RFPD will host a standalone website, www.richardsonrfpd.com, to provide electronic design engineers and buyers with improved access and streamlined navigation to the latest new products from the industry’s leading suppliers of RF, Wireless and Energy technologies. Website visitors connecting to the old, shared rell.com website will now see a link to the new richardsonrfpd.com site. Richardson RFPD Inc. announced it has completed a global distribution agreement with TRU Corp., a leader in the design, development and manufacture of custom, high performance RF/microwave interconnect solutions. TRU’s sophisticated, durable High Power cable assemblies provide power handling capabilities up to 6 times better than traditional RF assemblies. Richardson RFPD Inc. announces immediate availability and full design support capabilities for a new family of GPS modules featuring SiRFstarIV™ GPS technology from Maestro-Wireless Solutions . These modules are offered in flash and ROM memory versions, as well as a highly-integrated GPS/Smart antenna version, to best meet varying application requirements. Richardson RFPD Inc. announces immediate availability and full design support capabilities for three new RF Surface Acoustic Wave (SAW) filters from TriQuint Semiconductor Inc..
Richardson RFPD Inc. announced it will be joining with Analog Devices Inc. to present a free one-hour webinar explaining how to optimize infrastructure and point-to-point (PTP) radio designs using highly integrated RF ICs. The webinar will be hosted by Microwave Journal on Wednesday, March 28, 2012, beginning at 8:00 AM PT/11:00 AM ET/3:00 PM UTC. Registration is available through Microwave Journal’s Events site. Richardson RFPD Inc. announces immediate availability and full design support capabilities for a line of high reliability DC link power film capacitors from Spectrum Advanced Specialty Products. Richardson RFPD Inc. announced the availability and full design support capabilities for a SiC MOSFET driver reference design from Microsemi Corporation. The MSCSICMDD/REF1 is designed to provide a reliable reference driver solution, a means of evaluating silicon carbide MOSFETs in a number of different topologies, as well as a means to assess device performance for parametric test purposes. Richardson RFPD Inc. announced the availability and full design support capabilities for two GaN on SiC RF transistors from Qorvo. The discrete GaN on SiC HEMTs operate from DC to 4 GHz. The QPD1009 is a 15 W, 50 V device with an output power level of 17 W at 2 GHz, and a linear gain of 24 dB at 2 GHz. The 10 W, 50 V QPD1010 features an output power of 11 W at 2 GHz and a linear gain of 24.7 dB at 2 GHz. Richardson RFPD Inc. announced the availability and full design support capabilities for a X-band GaN power amplifier from Qorvo. The TGM2635-CP operates from 7.9 to 11 GHz and provides 100 W of saturated output power with 22.5 dB of large signal gain and greater than 35% power-added efficiency. It is offered in a 10-lead 19.05 mm x 19.05 mm bolt-down package with a pure Cu base for superior thermal management. Richardson RFPD Inc. introduced two GaAs MMIC fundamental mixers from Analog Devices. The HMC557A is a general-purpose, double balanced mixer in a 24-lead, ceramic 4 mm x 4 mm LCC package that can be used as an up-converter/down-converter from 2.5 to 7 GHz. The HMC773A general-purpose, double balanced mixer, available in a 24-lead, ceramic 3 mm x 3 mm LCC package, can be used as an up-converter/down-converter from 6 to 26 GHz. Richardson RFPD, Inc. announced the availability and full design support capabilities for a silicon carbide power MOSFET from Wolfspeed, a Cree Company. The 1000 V, 65 mΩ C3M0065100K is in an optimized four-lead TO-247-4 package with a separate driver source pin. This package provides lower switching losses with minimal gate circuit ringing due to the Kelvin gate connection. The package features a notch between the drain and source pins. Richardson RFPD Inc. announced the availability and full design support capabilities for a series of high-power SMT attenuators from ATC. The AT0603 Series provides virtually flat loss over a broad frequency spectrum and is ideal where low noise, low inductance and low parasitic capacitance is required. The film metallization provides stable characteristics over temperature and time. Richardson RFPD Inc. announced the availability and full design support capabilities for a family of evaluation boards from GaN Systems Inc. The GS665XXX-EVBDB daughterboard evaluation kits consist of two GaN Systems 650 V GaN enhancement-mode HEMTs (E-HEMTs) and all necessary circuits, including half-bridge gate drivers, isolated power supplies and optional heatsink to form a functional half-bridge power stage. Richardson RFPD Inc. announced the availability and full design support capabilities for an image reject mixer from Peregrine Semiconductor Corporation. The PE41901 is a passive, double-balanced Ku-band image reject mixer with high dynamic range performance and high local oscillator (LO) isolation capable of operation up to 19 GHz. It can be used as an upconverter or a downconverter. Richardson RFPD Inc. announced the availability of a integrated, dual RF transceiver from Analog Devices, Inc. ADI's AD9371 is a highly-integrated, wideband RF transceiver offering dual channel transmitters and receivers, integrated synthesizers, and digital signal-processing functions. With a tuning range of 300 MHz to 6 GHz, 250 MHz signal bandwidth, and power consumption of less than 5 W under standard operating conditions. Richardson RFPD Inc. announced the availability and full design support capabilities for a new bi-directional surface-mount coupler from Innovative Power Products, Inc. The IPP-8036 is one of the featured surface-mount products from IPP’s full line of dual directional couplers. It is a 300 W, 50 dB dual directional coupler that operates from 20 MHz to 1000 MHz. Richardson RFPD Inc. announced the availability and design support capabilities for an UltraCMOS® FET driver from Peregrine Semiconductor Corporation. The PE29100 integrated high-speed driver is designed to control the gates of external power devices, such as GaN Systems’ E-HEMT gallium nitride FETs. The outputs of the PE29100 are capable of providing switching transition speeds in the sub-nanosecond range for hard switching applications up to 33 MHz. Richardson RFPD, Inc. announced the availability and support capabilities for four GaN on SiC high-electron-mobility transistors from Qorvo. The QPD1000 is a 15 W (P3dB), 50 Ω-input matched discrete GaN on SiC HEMT, the QPD1003 is a 500 W (P3dB) internally-matched discrete GaN on SiC HEMT and the 125 W (P3dB) QPD1008L and 65 W (P3dB) QPD1015L are wideband unmatched discrete GaN on SiC HEMTs. Richardson RFPD Inc. announced the availability for an ultra capacitor cell from Maxwell Technologies. The BCAP3000P300K04 is Maxwell’s first 3-volt cell and an addition to the K2 family of products. The 3 V cell provides higher energy density in the same industry standard 60 mm cylindrical design and an electrostatic storage capability that can cycle a million charges and discharges without performance degradation. Richardson RFPD Inc. announced the availability and full design support capabilities for a 20 W SPDT switch from MACOM Technology Solutions Inc. The MASW-011071 is a terminated silicon PIN diode SPDT switch designed for X-band high-power, high-performance applications. The switch is assembled in a lead-free 7 mm, 44-lead PQFN plastic package and handles greater than 20 W of continuous wave (CW) power. Richardson RFPD Inc. announced the availability and full design support capabilities for two monolithic phase and amplitude controllers. The PE46130 and PE46140 are Peregrine's additions to its MPAC product family and offer maximum phase-tuning flexibility for Doherty PA optimization. 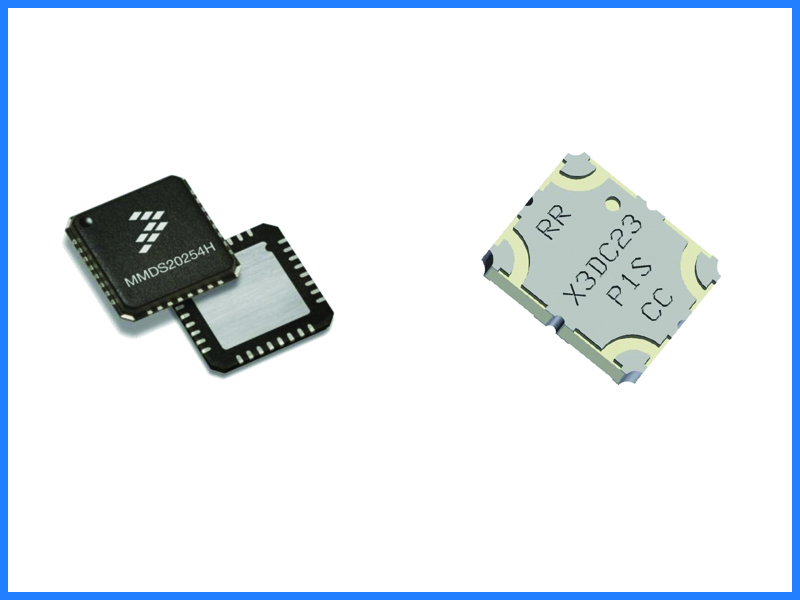 These monolithic RFICs integrate a 90° RF splitter, digital phase shifters and a digital step attenuator along with a low-voltage CMOS serial interface. They cover a phase range of 87.2° in 2.8° steps. Richardson RFPD Inc. announced the availability and full design support capabilities for a new LDMOS transistor from NXP Semiconductors. The MRF1K50H builds on the success of NXP's 1250 W MRFE6VP61K25H, delivering 1500 W CW at 50 V, along with superior ruggedness and thermal performance. The MRF1K50H can reduce the number of transistors in high-power RF amplifiers- decreasing amplifier size and BOM. Richardson RFPD Inc. announced the availability and full design support capabilities for a power limiter from MACOM Technology Solutions Inc. 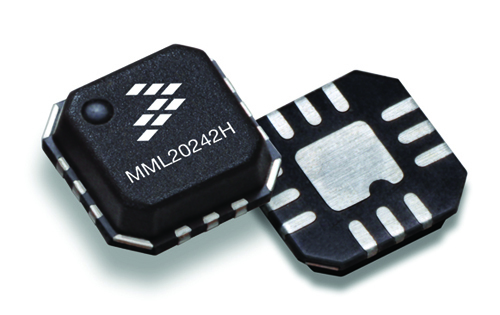 The MADL-011012 is a lead-free surface mount, high-power limiter, with an operating frequency range from 0.3 GHz to 1.0 GHz. It integrates the equivalent of 20 PIN, Schottky, limiter diodes, capacitors, inductors and resistors in a compact ceramic package. Richardson RFPD Inc. announced the availability and full design support capabilities for a silicon carbide power MOSFET from Wolfspeed, a Cree Company. According to Wolfspeed, the C2M0045170D is the industry’s first 1700 V, 45 mΩ SiC MOSFET. It offers high-speed switching with low capacitances, avalanche ruggedness, fast intrinsic diode with low reverse recovery (Qrr), and it is easy to parallel and simple to drive. Richardson RFPD Inc. announced the availability and full design support capabilities for a passive switch from MACOM Technology Solutions Inc. The MADP-011048 uses silicon PIN diodes in a non-magnetic surface mount package. There are two sets of diode pairs, constructed in an electrically-isolated, anti-parallel configuration, that operate from 5 to 400 MHz. MADP-011048 is well suited for MRI passive switching applications. 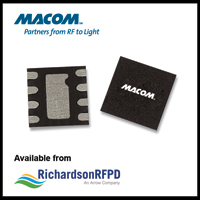 Richardson RFPD Inc. announced the availability and full design support capabilities for two 4 W power amplifiers from MACOM Technology Solutions Inc. The MAAP-011161 and MAAP-011193 are packaged linear PAs that operate from 7.1 to 7.9 GHz and 7.7 to 8.5 GHz, respectively. The devices offer OIP3 of +46.5 dBm and greater than +35.5 dBm Psat. The MAAP-011161 offers 22 dB small signal gain, while the MAAP-011193 provides 20 dB small signal gain. Richardson RFPD Inc. announced the availability and full design support capabilities for two series of DC/DC converters from RECOM Power Inc. (RECOM). The RKZ-xx2005D and RxxP22005D series are especially designed for SiC MOSFET driver applications with harsh environmental requirements. The DC/DC converters are available with input voltages of 5, 12, 15 or 24VDC, with two asymmetric outputs of +20 VDC and -5 VDC. Richardson RFPD Inc. announced the availability from stock and full design support capabilities for a fastPack 0 SiC power module from Vincotech. The 10-PC094PB065ME01-L637F06Y is a faster, cooler and more efficient power module designed for switching frequencies up to 400 kHz. It features a fast-switching 900 V SiC MOSFET that outperforms 1200 V SiC MOSFETs (+8% efficiency at a light load and +3% at full load) and provides a higher safety margin than 650 V MOSFETs. Richardson RFPD Inc. announced the availability and full design support capabilities for a half-bridge SiC power module from Wolfspeed, a Cree Company. The CAS325M12HM2 power module is configured in a half-bridge topology comprised of seven 1.2 kV 25 mΩ C2M SiC MOSFETs and six 1.2 kV 50 A Z-Rec Schottky diodes per switch position. CAS325M12HM2 features ultra-low loss and low (5 nH) inductance, ultra-fast switching operation, zero reverse recovery current from the diode, and more. Richardson RFPD Inc. announced the availability and full design support capabilities for a UltraCMOS® SPDT RF switch from Peregrine Semiconductor Corporation. The PE42723 is a HaRP™ technology-enhanced reflective SPDT RF switch designed for use in cable applications, including DOCSIS 3.0/1 cable modem, set-top box and residential gateway. It delivers high linearity and excellent harmonics performance in the 5 to 1794 MHz band, as well as low insertion loss and high isolation performance. Richardson RFPD Inc. announced the availability and full design support capabilities for a new UltraCMOS® digital step attenuator (DSA) from Peregrine Semiconductor Corporation. The PE4314 is a 75Ω HaRP™ technology-enhanced, 6-bit RF DSA that operates from 1 MHz to 2.5 GHz and features glitch-less attenuation state transitions and low distortion. It supports 1.8 V control voltage and an extended operating temperature range up to +105° C.
Richardson RFPD Inc. announced the availability and full design support capabilities for a new UltraCMOS® quad MOSFET mixer from Peregrine Semiconductor Corporation. The PE4152 is a high-linearity quad MOSFET mixer with an integrated local oscillator (LO) buffer amplifier. The LO amplifier allows for LO input drive levels of less than 0 dBm to produce third-order intercept point (IIP3) values similar to a quad MOSFET array driven with a +15 dBm LO drive. Richardson RFPD Inc. announced the availability and full design support capabilities for a 100 W continuous wave SPDT reflective switch from Microsemi Corporation. The MPS2R10-606 SPDT series-shunt PIN diode switch operates from 50 to 1000 MHz, with 500 ns switching speed. At 100 MHz, it typically offers 60 dB isolation, with 0.1 dB insertion loss and 28 dB return loss. At 500 MHz, it typically offers 55 dB isolation, 0.2 dB insertion loss, and 15 dB return loss. Richardson RFPD Inc. announced the availability and full design support capabilities for a new gallium arsenide flip-chip hyperabrupt varactor diode from M/A-COM Technology Solutions. The high-frequency MAVR-011020-1411 offers 0.025 pF total capacitance at 1 MHz/15V, a Q factor of 3000, and constant gamma for linear tuning. The device is suitable for point-to-point, electronic scanning antenna arrays, electronic warfare (EW), and other Aerospace & Defense applications. Richardson RFPD Inc. announced the availability and full design support capabilities for a new power amplifier from M/A-COM Technology Solutions. The MAAP-011199 is a balanced 3-stage gallium arsenide (GaAs) pHEMT MMIC power amplifier that operates from 80 to 100 GHz and typically provides +24 dBm of saturated output power. The power amplifier’s balanced architecture results in excellent input and output match to 50Ω across the entire 80 to 100 GHz frequency band. Richardson RFPD Inc. announced the availability and full design support capabilities for two X-band GaN power amplifiers from Qorvo. The TGA2622-SM and TGA2624-SM operate from 9 to 10 GHz and are offered in 7 mm x 7 mm air-cavity, laminate-based QFN packages. For both devices, the RF ports are internally DC blocked and matched to 50 ohms, enabling simple system integration. Richardson RFPD Inc. announced the availability of a selection of Anaren devices for RF energy applications. RF energy refers to the emerging technology that uses an all solid-state semiconductor chain to generate RF power for heating and processing. Magnetron tubes are the primary technology employed for these applications. The benefits of solid-state RF energy over magnetron tubes include a lower-voltage drive, smaller form factor, and greatly-enhanced reliability. Richardson RFPD Inc. announced the availability and full design support capabilities for a selection of SDI video and optoelectronics products from M/A-COM Technology Solutions. MACOM’s SDI video products span a complete signal chain for an SDI link, including multi-rate equalizer and cable driver solutions for emerging ultra-high-definition (UHD) TV standards and legacy 3G, HD and SD. Richardson RFPD Inc. announced the availability and full design support capabilities for a LDMOS transistor from NXP Semiconductors. The MRF8VP13350NR3 is a 350 W CW transistor designed for industrial, scientific and medical (ISM) applications in the 700 MHz to 1300 MHz frequency range. It is capable of 350W CW or pulse power in narrowband operation. The device is internally input matched for ease of use, and it can be used single-ended or in a push-pull configuration. Richardson RFPD Inc. announced the availability and full design support capabilities for a monolithic phase and amplitude controller (MPAC) from Peregrine Semiconductor Corporation. The PE46120 covers a frequency range of 1.8 GHz to 2.2 GHz and integrates a 90-degree hybrid splitter, digital phase shifters and a digital step attenuator (DSA), along with a low voltage CMOS serial interface. The MPAC is designed for precise phase and amplitude control of two independent RF paths. Richardson RFPD Inc. announced the availability and full design support capabilities for a new receiver from M/A-COM Technology Solutions. The XR1020-QH is a 31 to 36 GHz receiver with a noise figure of 3 dB and 14 dB conversion gain. It integrates a low noise amplifier, image reject mixer and LO buffer amplifier within a fully-molded, lead-free, 4-millimeter, 24-lead PQFN package. Richardson RFPD Inc. announced the availability and full design support capabilities for a divide-by-4 prescaler from Peregrine Semiconductor Corporation.The PE35400 is a high-performance UltraCMOS® prescaler with a fixed divide ratio of 4 and an operating frequency range from 3 to 13.5 GHz. It operates on a single voltage supply with a frequency-selecting bias resistor, draws a low current of 16 mA, and has a low SSB phase noise of -135 dBc/Hz at 3.025 GHz output frequency. Richardson RFPD Inc. announced the availability and full design support capabilities for a new six-channel silicon carbide MOSFET driver from Wolfspeed, a Cree Company. The CGD15FB45P1 features six output channels, isolated power supply, a direct-mount low inductance design, short circuit protection, and over-temperature and under-voltage protection. The new gate driver has a smaller footprint and enhanced functionality over the previous version. Richardson RFPD Inc. announced the availability and full design support capabilities for a SP2T reflective switch from M/A-COM Technology Solutions. The MASW-011060 is a high-power PIN diode SP2T switch in a common anode configuration, operating from 0.5 to 6.0 GHz. It features low insertion loss and excellent linearity and is capable of handling 100 W continuous wave of incident power at a base plate temperature of 85ºC. Richardson RFPD Inc. announced the availability and full design support capabilities for a new single-pole, double-throw switch from Skyworks Solutions Inc. The SKYA21001 features low insertion loss (0.4 dB at 2.4 GHz) and positive voltage operation with low DC power consumption (10 μA). It is ideally suited for automotive applications such as infotainment, telematics, automated toll systems, garage door openers, 802.11b/g/n WLAN, Bluetooth, remote keyless entry, and GPS/navigation. Richardson RFPD Inc. announced a new power amplifier from ANADIGICS. The AWL5911 is an easy-to-use module that delivers high levels of linearity and efficiency for high data rate applications. Designed for the 5 GHz WLAN standards, it supports IEEE 802.11a/n/ac applications. Requiring only a single +3 to +5 V supply and a CMOS-compatible 1.8 V enable voltage, the AWL5911 reduces system power consumption by offering a low leakage current while the amplifier is shut down. Richardson RFPD Inc. announced the availability and full design support capabilities for two Ka-band power amplifiers from M/A-COM Technology Solutions.The MAAP-011139 is a 4-stage, 4 W power amplifier that operates from 28.5 to 31 GHz and provides 22 dB of linear gain. The MAAP-011246 is a 4-stage, 2 W power amplifier that operates from 27.5 to 31.5 GHz and provides 23 dB of linear gain. Richardson RFPD Inc. announced the availability and full design support capabilities for a 2.4 GHz WLAN/BT LTE coexistence filter from Qorvo. The 885128 is a high-performance, high-power bulk acoustic wave (BAW) band-pass filter with extremely steep skirts. It simultaneously exhibits low loss in the WiFi band and high near-in rejection in the approximate LTE bands. The new BAW filter is specifically designed to enable coexistence of WiFi and LTE signals. Richardson RFPD Inc. announced the availability and full design support capabilities for a new ultra-low-noise, flat gain LNA from Qorvo. The TQL9092 provides a gain flatness of 2 dB (peak-to-peak) over a wide bandwidth—from 1.5 to 3.6 GHz. At 2.6 GHz, the amplifier typically provides 22.6 dB gain, +37 dBm OIP3 at a 65 mA bias setting, and 0.6 dB noise figure. The LNA can be biased from a single positive supply ranging from 3.3 to 5 volts. It is offered in a 2 mm x 2 mm surface-mount package. Richardson RFPD Inc. announced the availability and full design support capabilities for two high-power receive protection circuit limiters from Qorvo. Using Qorvo’s passive GaAs VPIN technology, the new devices do not require bias and are offered in small plastic overmold packages. This simplifies system integration while maximizing performance and protection. The limiters are ideal for commercial and military radar applications, communications systems and electronic warfare. Richardson RFPD Inc. announced the availability and full design support capabilities for two Wi-Fi-integrated PA modules from Qorvo. The RFPA5522 and RFPA5542 are three-stage power amplifiers designed for 802.11a/n/ac applications. The integrated input and output 50Ω match greatly reduces the layout area, bill of materials and manufacturability cost in the customer application. The devices are manufactured on an advanced InGaP heterojunction bipolar transistor (HBT) process. Richardson RFPD Inc. announced the availability and full design support capabilities for a broadband LNA from Skyworks Solutions Inc. The SKY67159-396LF single-stage, GaAs pHEMT LNA operates from 200 to 3800 MHz and features superior gain flatness and exceptional linearity in a compact 2 mm x 2 mm, 8-pin, dual flat no-lead package. It is designed for FDD and TDD 2G/3G/4G LTE small-cell base stations, as well as LMR, Milcom and M2M applications. Richardson RFPD Inc. announced the availability and full design support capabilities for a GaAs MMIC low-noise, wideband amplifier from Analog Devices Inc. The HMC753LP4E operates between 1 and 11 GHz, providing up to 16.5 dB of small signal gain, 1.5 dB noise figure, and output IP3 of +30 dBm, while requiring only 55 mA from a +5 V supply. The P1dB output power of up to +18 dBm enables the LNA to function as an LO driver for balanced, I/Q or image reject mixers. Richardson RFPD Inc. announced the availability and full design support capabilities for three discrete power GaN on SiC HEMTs from Qorvo. The TGF2952, TGF2953 and TGF2954 are designed using Qorvo’s proven TQGaN25 production process that features advanced field plate techniques to optimize microwave power and efficiency at high drain bias operating conditions. The HEMTs feature maximum power added efficiency levels that make them appropriate for high efficiency applications. Richardson RFPD Inc. announced the availability a new dual-channel SiC MOSFET driver from Wolfspeed, a Cree Company. The CGD15HB62P1 features two output channels, an integrated isolated power supply, direct-mount low induction design, short circuit protection and under-voltage protection. It is a gate driver for use in industrial applications for two of Wolfspeed’s 1200 V SiC MOSFET power modules, the 300 A CAS300M12BM2 and the 120 A CAS120M12BM2. Richardson RFPD Inc. announced the availability and full design support capabilities for a new 700 to 3800 MHz, UltraCMOS® SPDT RF switch from Peregrine Semiconductor Corporation. The PE42822 is a HaRP™ technology-enhanced absorptive 50Ω SPDT RF protection switch designed for use in high-power and high-performance wireless infrastructure and small cell applications, supporting frequencies up to 3800 MHz. Richardson RFPD Inc. announced the availability and full design support capabilities for a 2 W GaN driver amplifier from Qorvo. The TGA2958-SM is a packaged Ku-band amplifier fabricated on Qorvo’s 0.15 um GaN on SiC production process (QGaN15). Operating over a 13 to18 GHz bandwidth, the TGA2598-SM delivers 2 W of saturated output power with 20 dB large signal gain and > 25% power added efficiency. Richardson RFPD Inc. announced the availability for a 1700 V SiC MOSFET. The C2M1000170J features high blocking voltage with low RDS (on), low parasitic inductance, ultra-low drain gate capacitance, and a separate driver source pin. It is easy to parallel and simple to drive. The new MOSFET offers higher system efficiency, smooth switching waveforms, reduced cooling requirements, and increased system reliability. Richardson RFPD Inc. announced the availability and full design support capabilities for a power amplifier from M/A-COM Technology Solutions. The MAAP-011140-DIE is a 4-stage, 6 W power amplifier in bare die form that is fabricated using a GaAs pHEMT device process featuring full passivation for enhanced reliability. The power amplifier operates from 27.5 to 30.0 GHz and provides 24 dB of linear gain, 6 W saturated output power, and 23% power added efficiency. Richardson RFPD Inc. announced the availability and full design support capabilities for a new dual differential, single pole double throw RF switch. The PE42920 DDSPDT RF switch is a broadband (10 kHz to 6 GHz) and low loss device that enables the switching of two independent differential signals. This device consumes less power than active differential switches. It has high isolation between same-channel inputs, as well as opposite active channels. The TAT7472A1F is a 75 Ω RF amplifier designed for CATV use but capable of operation up to 1218 MHz, making it suitable for DOCSIS 3.1. It contains two separate amplifiers for push-pull applications and is fabricated using 6-inch GaAs pHEMT technology. Each amplifier contains on-chip active biasing, with bias current set points that are adjustable with a single resistor from the input to ground. Typical supply voltage for the TAT7472A1F is +5 V.
Richardson RFPD Inc. announced the availability and full design support capabilities for a dual, 14-bit, 500 MSPS analog-to-digital converter from Analog Devices Inc. The AD9684 includes an on-chip buffer and a sample-and-hold circuit designed for low power, small size, and ease of use. The new ADC is specifically designed for sampling wide bandwidth analog signals. It is optimized for wide input bandwidth, a high sampling rate, excellent linearity, and low power in a small package. Richardson RFPD Inc. announced the availability and full design support capabilities for a new GaN power amplifier from TriQuint / Qorvo. The TGA2239-CP is a 3-stage, 35 W power amplifier operating over the 13.4 to 15.5 GHz band. Fabricated on Qorvo’s production 0.15 µm GaN on SiC technology, this high performance amplifier offers greater than 30 dB small-signal gain with 34% PAE, allowing a system designer to achieve superior performance levels in a cost efficient manner. Richardson RFPD Inc. announced the availability and full design support capabilities for a gallium nitride bias controller/sequencer module from M/A-COM Technology Solutions. The MABC-001000-DP000L provides proper gate voltage and pulsed drain voltage biasing for a device under test (DUT). The bias controller module offers protection and dynamic control of all MACOM high-power transistors, including its GaN portfolio. Richardson RFPD Inc. announced the availability and full design support capabilities for two GaN transistors from Qorvo. The 5W TGF3020-SM and 30 W TGF3021-SM input-matched transistors enable high linear gain and power efficiency in low-cost, space-saving surface-mount plastic QFN packages. The integrated input matching network enables wideband gain and power performance, and the output can be matched on-board to optimize power and efficiency for any region within the band. Richardson RFPD Inc. announced the availability and full design support capabilities for a range of Xinger® couplers for aerospace and defense applications from Anaren. Offering a wide bandwidth range, high isolation/directivity, low insertion loss and ENIG plating finish, these high-reliability hybrid and directional couplers are ideal for aerospace and defense applications where size, weight and power (SWAP) are critical. Richardson RFPD Inc. announced the availability and full design support capabilities for a new 2 W power amplifier from M/A-COM Technology Solutions. The MAAP-011145 is assembled in a 7 mm surface mount, lead-free cavity package with a temperature compensated integrated power detector operating from 17.65 to 19.75 GHz. The circuit provides 25 dB small signal gain, +43 dBm OIP3, 2W P1dB, +34.5 dBm saturated output power, and bias of 1330 mA at 6 V.
The RM022020 features Qorvo’s patented Spatium™ combining technology to provide unprecedented performance in a general purpose laboratory bench top amplifier for applications that include lab work, test and measurement, load pull, EMI test, and anechoic chambers and test ranges. It is suitable for use a driver/booster amplifier, enabling more power incident upon the device under test (DUT). Richardson RFPD Inc. introduced a family of DOCSIS 3.1 active components from M/A-COM Technology Solutions. The new family of amplifiers cover upstream and downstream bands and complement MACOM's recently-introduced portfolio of DOCSIS 3.1-compliant passive components. The amplifiers are designed for head-end, node, system and line access equipment requiring broad bandwidth, high output power and low distortion. The ACA2431 is a highly linear, high output power integrated RF amplifier designed for CATV headends and HFC distribution systems. The IC consists of two parallel amplifiers that are optimized for exceptionally low distortion, high output power, and high crash point. A GaN output stage is incorporated to minimize the operating (bias) current and provides high gain over the 50 to 1218 MHz CATV downstream band. Richardson RFPD Inc. announced the availability and full design support capabilities for a discrete GaN on SiC HEMT from TriQuint / Qorvo. The 30 W (P3dB) T2G4003532 operates from DC to 3.5 GHz and is constructed with TriQuint’s TQGaN25 production process, which features advanced field plate techniques to optimize power and efficiency at high drain bias operating conditions. Richardson RFPD Inc. announced the availability and full design support capabilities for the portfolio of high-performance analog products from M/A-COM Technology Solutions. MACOM’s HPA portfolio has grown significantly and include products such as crosspoint switches, clock and data recovery modules (CDRs), transimpedance amplifiers (TIAs), optical drivers, equalizers, reclockers and VoIP processors. Richardson RFPD Inc. announced the availability and full design support capabilities for a wideband amplifier from M/A-COM Technology Solutions. The MAAM-011109-DIE is an easy-to-use, wideband amplifier that operates from DC to 50 GHz and features 15 dB of gain, +21 dBm P1dB (+15 dBm at 40 GHz), with 22 dB of reverse isolation, 15 dB return loss, and OIP3 of +29 dBm at 5V/190mA with VG1 = -0.4V. Richardson RFPD Inc. announced the availability and full design support capabilities for a new GaAs power amplifier from TriQuint / Qorvo. The TGA2621-SM is a packaged Ku-band PA fabricated on TriQuint’s TQPHT15 0.15 μm GaAs pHEMT process. It operates from 16 to 18.5 GHz and typically provides greater than 1 W of saturated output power with greater than 23% PAE and greater than 24.5 dB of small signal gain. Richardson RFPD Inc. announced the availability and full design support capabilities for three new digital step attenuators from Peregrine Semiconductor. The PE43711, PE43712 and PE43713 are 50 Ω, HaRP™ technology-enhanced, 7-bit RF DSAs that support applications from 9 kHz to 6 GHz. They feature glitch-less attenuation state transitions and support 1.8 V control voltage and an extended operating temperature range to +105°C. Richardson RFPD Inc. announced the availability and full design support capabilities for two new GaN RF power transistors from TriQuint / Qorvo. The TGF2929-FL and TGF2929-FS are 100 W discrete GaN on SiC HEMTs that operate from DC to 3.5 GHz. The devices are constructed with TriQuint’s TQGaN25HV process, which features advanced field plate techniques to optimize power and efficiency at high drain bias operating conditions. Richardson RFPD Inc. announced the availability of three Quasi-MMIC GaN on SiC HEMTs from United Monolithic Semiconductors. The CHZ015A-QEG is a 15 W, GaN HEMT that offers broadband solutions for a variety of RF L-band power applications, the CHZ050A-SEA is a 60 W, GaN HEMT that offers broadband solutions for a variety of RF C-band applications and the CHZ180A-SEB is a 200 W, wideband GaN HEMT that offers broadband solutions for a variety of RF L-band applications. Richardson RFPD Inc. announced the availability and full design support capabilities for a new RF single-pole double-throw (SPDT) switch from Peregrine Semiconductor Corporation. The PE423422 delivers excellent linearity and harmonics performance. It is designed to cover a wide range of automotive wireless applications from 100 to 6000 MHz, including automotive infotainment and traffic safety applications. Richardson RFPD Inc. announced the availability and full design support capabilities for a new discrete GaN on SiC HEMT from TriQuint / Qorvo. The 30 W (P3 dB) TGF3021-SM operates from 0.03 to 4.0 GHz and is constructed with TriQuint’s TQGaN25 production process, which features advanced field plate techniques to optimize power and efficiency at high drain bias operating conditions. Richardson RFPD Inc. announced the availability and full design support capabilities for a new LDMOS integrated power amplifier from Freescale. The AFIC10275N is the industry’s first RF power integrated circuitcovering the 978-1090 MHz band. It integrates two amplification stages in a plastic package, delivering 250 W with 31 dB of gain and 64% drain efficiency. The device also embeds temperature and RF sensing capabilities, reducing the need for external components. Richardson RFPD Inc. announced the availability and full design support capabilities for a new UltraCMOS switch from Peregrine Semiconductor Corporation. The PE42524 is a HaRP™ technology-enhanced reflective wideband SPDT RF switch die that operates from 10 MHz to 40 GHz and delivers high isolation performance, excellent linearity and low insertion loss. At 30 GHz, the PE42524 exhibits 17 dB active port return loss, 47 dB isolation and 2.2 dB insertion loss. Richardson RFPD Inc. announced the availability and full design support capabilities for a new discrete GaN on SiC HEMT from TriQuint / Qorvo. The 10 W (P3dB), 50 Ω input-matched TGF3015-SM operates from 0.03 to 3 GHz. The integrated input-matching network enables wideband gain and power performance, while the output can be matched on board to optimize power and efficiency for any region within the band. The device is housed in an industry-standard 3 mm x 3 mm package. Richardson RFPD Inc. announced the availability and full design support capabilities for range of RF solutions for aerospace and defense applications from Freescale Semiconductor, Inc. The portfolio encompasses a range of high-power solutions that support a wide range of needs for military applications, including avionics, HF through L- and S-band radar, communications, missile guidance, electronic warfare, and identification, friend or foe (IFF). Richardson RFPD Inc. announced the availability and full design support capabilities for a series of temperature-variable chip attenuators from Aeroflex/Inmet. The Powerfilm™ TCAF N05 Series operates from DC to 12 GHz and is designed to vary -.005 dB/dB/ºC to compensate for temperature-induced system gain variation without requiring a bias or control voltage. These attenuators consist of laser-trimmed thick film resistor elements on an alumina ceramic substrate with a protective paint layer. Richardson RFPD Inc. announced the availability and full design support capabilities for a new GaN on SiC 960 to 1215 MHz pulsed power HEMT from M/A-COM Technology Solutions. Using state-of-the-art wafer fabrication processes, this high performance transistor provides high gain, efficiency, bandwidth and ruggedness over a wide bandwidth. High breakdown voltages allow for reliable and stable operation in extreme mismatched load conditions. Richardson RFPD Inc. announced the availability and full design support capabilities for a new active rugged antenna from Maxtena, Inc. The M1227HCT-A2-SMA is designed for L1/L2 GPS and GLONASS bands, and specifically for applications requiring greater accuracy than L1 antennas can provide. The M1227HCT-A2-SMA features a screw-on design, with an integrated SMA connector. It offers superior filter­ing performance and is rated for 50 V/m out-of-band interference. Richardson RFPD Inc. announced the availability and full design support capabilities for a new GaAs power amplifier from M/A-COM Technology Solutions. The MAAP-011022 high power balanced amplifier operates from 2.7 to 3.0 GHz, provides 7 W of pulsed power, and is designed to operate at an 8% duty cycle. The new amplifier provides rugged performance under load mismatch, and its balanced architecture offers excellent return loss. Richardson RFPD Inc. announced the availability and full design support capabilities for a new discrete GaN on SiC HEMT from TriQuint / Qorvo. The 55 W (P3dB) T2G4005528-FS operates from DC to 3.5 GHz and is constructed with TriQuint’s TQGaN25 production process, which features advanced field plate techniques to optimize power and efficiency at high drain bias operating conditions. Richardson RFPD Inc. announced the availability and full design support capabilities for three new SMT multiband antennas from Fractus, S.A. The Fractus mXTEND™ antenna boosters have been specifically designed to provide multiband performance in wireless/mobile devices, enabling worldwide coverage by allowing operation in the communication standards GSM850, GSM900, GSM1800/DCS, GSM1900/PCS, UMTS, LTE700, LTE800, LTE850, LTE900, LTE1700, LTE1800, LTE1900, LTE2000, LTE2100, LTE2300, LTE2500, LTE2600, LTE3500 and LTE3700. Richardson RFPD Inc. announced the availability and full design support capabilities for an expanded portfolio of multi-octave, wideband MMIC devicesfrom Microsemi Corporation. The thirty-two additions to the portfolio include additional LNAs and medium-power amplifiers, as well as prescalers, voltage variable attenuators (VVAs), and amplifier modules. The new devices also extend the Microsemi MMIC family maximum operating frequency from 22 GHz to 65 GHz. Richardson RFPD Inc. announced the availability from stock and full design support capabilities for four 1200 V SiC MOSFET-based power modules from Vincotech. The modules are available in two versions. The first is a flow3xPHASE 0 SiC three-phase inverter module with 3x BUCK/BOOST and split output topology. The second version is the flow3xBOOST 0 SiC with three-channel boost circuits. Richardson RFPD Inc. announced the availability and full design support capabilities for a new RF switch from M/A-COM Technology Solutions. The MASW-011055 is a high power PIN diode SP2T switch in a common anode configuration, operating from 30 MHz to 3 GHz. It features low insertion loss and excellent linearity and is capable of handling 100 W CW incident power at a base plate temperature of 85ºC. Richardson RFPD Inc. announced today the availability and full design support capabilities for a new low passive mixer from M/A-COM Technology Solutions. The RF, LO and IF frequency ranges are 5 to 35 GHz, 3 to 33 GHz and DC to 4.5 GHz, respectively. The new mixer can be used for lower sideband (LSB) or upper sideband (USB) mixing, and two mixers can be combined in a quadrature configuration for optimal image rejection. Richardson RFPD Inc. announced the availability and full design support capabilities for a new 4 W power amplifier from M/A-COM Technology Solutions. The MAAP-011139-DIE is a four-stage, 4 W power amplifier that operates from 29 to 31 GHz and provides 24 dB of linear gain (at 30 GHz), 4 W saturated output power, and 23% efficiency while biased at 6 V. It is fabricated using a GaAs pHEMT process that features full passivation for enhanced reliability. Richardson RFPD Inc. announced the availability and full design support capabilities for a new UltraCMOS true DC RF switch from Peregrine Semiconductor Corporation. The PE42020 is a HaRP™ technology-enhanced SPDT true DC RF switch that operates from DC up to 8 GHz with integrated RF, analog and digital functions. It can be configured as a 50-ohm absorptive or open reflective switch and offers power handling of +30 dBm at 0 Hz and +36 dBm at 8 GHz. Richardson RFPD Inc. announced the availability and full design support capabilities for a low noise active mixer from M/A-COM Technology Solutions. The MAMX-011023 is used for down frequency conversion, features an ultra-wideband IF bandwidth of 8 GHz, and has the LO and RF driving the same pin. The mixer can be used for lower sideband (LSB) or upper sideband (USB) mixing. Richardson RFPD Inc. introduced the MMRF5014H, a 125 W continuous wave GaN on SiC transistor that offers exceptional wideband and thermal performance. With an extended operational bandwidth (1­ to 2690 MHz), high gain (16 dB at 2500 MHz, typical), and high ruggedness, the new transistor is ideally suited for wideband amplifiers in scientific equipment, as well as in military communications applications, including jammers and electronic warfare systems. Richardson RFPD Inc. announced the availability and full design support capabilities for a new 100 W single-pole, triple-throw reflective switch from MACOM. The MASW-011030 is offered in a common anode configuration and operates from 30 MHz to 3 GHz. It features low insertion loss and excellent linearity, with low DC consumption. Richardson RFPD Inc. announced the availability and full design support capabilities for five new power amplifiers for small cell applications from Skyworks Solutions, Inc. The five surface mount, +20 dBm linear output power amplifiers offer high gain, low power current consumption, low bill-of-materials count, ease of use, and a small footprint with input and output parts internally matched. Richardson RFPD Inc. announced the availability and full design support capabilities for two new tuning control switches from Peregrine Semiconductor Corporation. The PE613010 and PE613050 are the first two devices in a new family of tuning control switches based on Peregrine’s UltraCMOS® technology. Both of the new switches feature low on-resistance and insertion loss across key cellular frequency bands from 100 to 3000 MHz. Richardson RFPD Inc. announced the availability and full design support capabilities for a new integrated bias network from M/A-COM Technology Solutions. The MABT-011000 is a rugged, fully monolithic, broadband, surface mount bias network that utilizes MACOM’s patented HMIC process. It is ideally suited for the DC biasing of PIN diode control circuits and functions as an RF-DC decoupling network. Richardson RFPD Inc. announced the availability and full design support capabilities for a new up-converter from M/A-COM Technology Solutions. The MAUC-011003 is an integrated up-converter assembled in a lead-free 4 mm 24-lead PQFN plastic package. It features a typical conversion gain of 12 dB, image rejection of 15 dBc, and is integrated with an LO doubler, LO buffer amplifier, and RF buffer amplifier. Richardson RFPD Inc. announced the availability and full design support capabilities for two new L-band 90 W GaN modules from M/A-COM Technology Solutions. Both MAMG-000912-090PSM and MAMG-001214-090PSM 2-stage modules feature a land grid array (LGA) pattern for enhanced thermal flow, are offered in compact (14 x 24 mm2) “True SMT” packages, and do not require copper coining or complicated thermal management techniques on the system PC board. Richardson RFPD Inc. announced the availability from stock and full design support capabilities for a new 1.2 kV, 80 m Ω all-SiC six-pack (three-phase) module and associated six-channel gate driver from Cree, Inc. The CCS020M12CM2 includes C2M™ MOSFETs and Z-Rec™ diodes. Richardson RFPD Inc. announced the availability and full design support capabilities for a new 1.7 kV, 8.0 m Ω, 300 A all-silicon carbide half-bridge module and associated 1.7 kV driver from Cree, Inc. The CAS300M17BM2 includes C2M™ MOSFETs and Z-Rec™ diodes and features ultra-low loss and high-frequency operation. Richardson RFPD Inc. announced the availability and full design support capabilities for a new RF single-pole four-throw switch from Peregrine Semiconductor Corporation. The PE423641 is HaRP™ technology-enhanced and features insertion loss of 0.5 dB and isolation of 32 dB at 1000 MHz, and IIP3 of +68 dBm. Richardson RFPD Inc. announced the availability and full design support capabilities for two 2.7 to 3.7 GHz packaged GaN power amplifiers from TriQuint. The TGA2583-SM and TGA2585-SM are designed using TriQuint’s production 0.25-μm GaN on SiC process. The new devices can operate under both pulse and continuous wave (CW) conditions, and both feature RF ports that are fully matched to 50 ohms. Richardson RFPD Inc. announced the availability and full design support capabilities for a new multiple input and multiple output, RF transceiver from Lime Microsystems. The LMS7002M is a fully-integrated, multiband, multi-standard, programmable MIMO RF transceiver. Richardson RFPD Inc. announced the availability and full design support capabilities for a new SiC MOSFET evaluation kit from Cree, Inc. The KIT8020CRD8FF1217P-1 evaluation kit can be used to demonstrate the high performance of Cree’s 1200 V SiC MOSFETs and SiC Schottky diodes. Richardson RFPD Inc. announced the availability and full design support capabilities for a new four-stage E-band driver amplifier from M/A-COM Technology Solutions. The MAAM-011167 is a bare die power amplifier that operates from 71 to 86 GHz and provides 18 dB small signal gain. The input and output are matched to 50Ω with bond wires to external board. Richardson RFPD Inc. announced the availability and full design support capabilities for three new 1200 V, 80 mΩ SiC MOSFETs from Microsemi Corporation. The new MOSFETs are built on SiC MOSFET technology, which features best-in-class RDS(on) vs. temperature, ultra-low gate resistance for minimizing switching energy loss, superior maximum switching frequency, and outstanding ruggedness. Richardson RFPD Inc. announced the availability and full design support capabilities for two SP4T RF switches from Peregrine Semiconductor Corporation. The PE42542 and PE42543 are HaRP™ technology-enhanced absorptive SP4T RF switches that operate from 9 kHz to 18 GHz and are designed for use in test/ATE, microwave and other wireless applications. Richardson RFPD Inc. today announces immediate availability and full design support capabilities for three new 20 W power amplifiers from Wavelex. The new 50-ohm, unconditionally stable PAs operate from a single DC power supply and cover down to 820 MHz and up to at least 890 MHz. They feature infinite load VSWR protection and a minimum of 50% power added efficiency, and they are SMA-connectorized. Richardson RFPD Inc. announces immediate availability and full design support capabilities for three new 20 W power amplifiers from Wavelex. The new 50-ohm, unconditionally stable PAs operate from a single DC power supply and cover down to 820 MHz and up to at least 890 MHz. They feature infinite load VSWR protection and a minimum of 50% power added efficiency. Richardson RFPD Inc. announced the availability and full design support capabilities for three converters from Analog Devices Inc. The new devices include a digital-to-analog converter (AD9144), an analog-to-digital converter (AD9625), and a dual analog-to-digital converter (AD9680). All of the devices are suitable for a range of applications. Richardson RFPD Inc. announces immediate availability and full design support capabilities for three 16 W power amplifiers from Wavelex. The 50-ohm, unconditionally stable PAs operate from a single DC power supply and cover 1805 to 1880, 1930 to 1990, and 2110 to 2170 MHz frequency ranges - common bands for test and measurement applications. Richardson RFPD Inc. announced the availability for a new solid state broadband high power amplifier from Empower RF Systems, Inc. The 2175/BBS2E4ARR is suitable for multi-octave bandwidth, high-power continuous wave, modulated, and pulsed applications. It utilizes high-power LDMOS devices that provide wide frequency response, high gain, high peak power capability, and low distortions. Richardson RFPD Inc. announced the availability and full design support capabilities for a new fast switching 2-bit RF digital step attenuator from Peregrine Semiconductor Corporation. The broadband PE43205 operates from 35 to 6000 MHz, covers an 18 dB attenuation range in 6 dB and 12 dB steps, with 29 ns switching time. Richardson RFPD Inc. announced the availability of two power limiter ICs from Peregrine Semiconductor Corporation. The PE45140 and PE45450 are HaRP™ technology-enhanced RF power limiters with symmetric RF ports that limit incident power up to 50 W. They offer wideband frequency range, maximum power handling of +47 dBm pulsed (50 W) and +40 dBm CW (10 W). Richardson RFPD Inc. announced the availability and full design support capabilities for a new family of high performance baluns from M/A-COM Technology Solutions. The eight new devices are designed for CATV MoCA applications requiring high performance transformer baluns. Richardson RFPD Inc. announces immediate availability and full design support capabilities for two 24 W Psat (20 W P1dB) power amplifiers from Wavelex. The 50-ohm PAs operate from 925 GHz to 960 GHz, offer high gain, low gain flatness, and high power added efficiency. They are ideally suited for GSM, mobile infrastructure, and fixed wireless communication applications. Richardson RFPD Inc. announced the availability and full design support capabilities for a new 22 to 38 GHz low noise amplifier from M/A-COM Technology Solutions. The MAAL-011111 is a three-stage GaAs MMIC LNA featuring a small signal gain of 19 dB with a noise figure of 2.5 dB. It is offered in a lead-free, 3 x 3 mm QFN package, does not need external components, and is self-biased. Richardson RFPD Inc. announced the availability and full design support capabilities for a 75 Ω reverse path variable gain amplifier from M/A-COM Technology Solutions. The MAAM-011186 is an integrated two-stage differential amplifier operating from 5 to 300 MHz, with an embedded digital step attenuator (DSA) for CATV reverse path applications. Richardson RFPD Inc. announced the availability for three ultra-fast 650 V NPT IGBTs. These transistors represent the newest generation of Microsemi IGBTs optimized for outstanding ruggedness and best trade-off between conduction and switching losses. They feature zero reverse recovery, low leakage, anti-parallel silicon carbide diodes, low saturation voltage, low tail current, and more. Richardson RFPD Inc. announced the availability and full design support capabilities for a new 15 W X-band power amplifier from M/A-COM Technology Solutions. The MAAP-015036 is a two-stage GaAs MMIC PA operating from 8.5 to 10.5 GHz, with a saturated pulsed output power of +42 dBm and a large signal gain of 17 dB. The MAAP-015036 is available in die form. Richardson RFPD Inc. announced the availability and full design support capabilities for a new 2-way, 90-degree power splitter from M/A-COM Technology Solutions. The MAPD-011018 operates from 5 to 250 MHz and offers excellent temperature stability, low power loss, high signal separation, and even power distribution. Richardson RFPD Inc. announced the availability and full design support capabilities for a new 1 to 2 GHz, 320 W peak power limiter from M/A-COM Technology Solutions. The MADL-011014 is ideally suited for high peak and continuous wave receive-protection applications where high-performance surface mount limiter assemblies are required, including air traffic management and radar systems. Richardson RFPD Inc. announced the availability and full design support capabilities for a four-stage, 71 to 86 GHz, bare die power amplifier from M/A-COM Technology Solutions. The MAAP-011106 provides +25 dBm saturated output power and 20 dB small signal gain. The input and output are matched to 50Ω with bond wires to the external board. Richardson RFPD Inc. announced the availability and full design support capabilities for a range of new, multi-octave, wideband MMIC devices, including a switch and eight amplifiers, from Microsemi Corporation. The new devices provide outstanding electrical performance, with frequency coverage as wide as DC to 22 GHz. The MAAL-011078 is designed for operation from 700 MHz to 6 GHz and is housed in a lead-free 2 mm 8-lead PDFN plastic package. The LNA has an integrated active bias circuit, allowing direct connection to 3 or 5 V bias and minimizing variations over temperature and process. V bias can be utilized as an enable pin to power the device up and down during operation. Richardson RFPD Inc. announced the availability and full design support capabilities for a new 650 V, 20 A silicon carbide (SiC) Schottky diode from Cree Inc. Benefits of the CVFD20065A include the option of replacing bipolar with unipolar rectifiers, essentially no switching losses, the reduction of heat sink requirements, and the ability to have parallel devices without thermal runaway. Richardson RFPD Inc. announced the availability and full design support capabilities for two series of precision tolerance, NP0 RF microwave capacitors from American Technical Ceramics Corp. (ATC). The high-frequency, low-loss (Hi-Q) 400L series and 400S series capacitors feature a precision thin-film process that provides reliable and repeatable performance, and high series resonant frequency. Richardson RFPD Inc. announces availability and full design support capabilities for a wideband, 20 W load RF termination from Wavelex. The WLD000130A1 offers wide frequency band operation, from DC to 13.0 GHz and features 20 W continuous wave (CW) power handling. It is versatile for a range of applications, including satellite communications, broadcast, RF bench test, and mobile base station. Richardson RFPD Inc. announced the availability and full design support capabilities for selected parts from the DG series of wire wound ferrite inductors from TOKO. The DG8040C and DG6045C are part of a new line of wire wound ferrite inductors that cover an inductance range of 1 to 100 µH and feature higher current than previous models. Both device families are RoHS-compliant and magnetically shielded. Richardson RFPD Inc. announced the availability and full design support capabilities for two new gallium nitride on silicon carbide (GaN on Sic) from TriQuint. The TGA2216-SM is a wideband cascode amplifier that offers exceptional wideband performance and also supports 40 V operation and the TGA2237-SM is a wideband distributed amplifier that operates from 0.03 to 2.5 GHz. Richardson RFPD Inc. announced the availability and full design support capabilities for a new 1.2 kV, 5.0 mΩ all-silicon carbide (SiC), half-bridge module from Cree, Inc. The new CAS300M12BM2 is available in a 62 x 106 x 30 millimeter package and includes a Z-FET™ MOSFET and a Z-Rec™ diode in a half-bridge configuration. Arrow RF & Power announced the availability and full design support capabilities for a new high-performance integer-N phase-locked loop (PLL) from Peregrine Semiconductor Corporation. The PE33241 is capable of frequency synthesis up to 5 GHz and offers a low phase noise figure of merit and offers superior phase noise performance with a direct or serial programming option. Ideally suited for commercial and military S-band radar applications Richardson RFPD Inc. announces full design support capabilities and immediate availability of four new gallium nitride on silicon carbide (GaN on SiC) power amplifiers (PAs) from TriQuint. The new S-band amplifiers are fabricated on TriQuint’s production 0.25 μm GaN on SiC process (TQGaN25). Richardson RFPD Inc. announced that the CloudGate M2M gateway from Option has been selected by Simply Home, LLC ("SimplyHome") to provide, in conjunction with Aeris Communications ("Aeris") cellular service, 3 G coverage to all its customers. CloudGate's multi-network capability means that it uses the best Aeris network coverage (GSM or CDMA) at the particular location of each customer. Richardson RFPD Inc. announces immediate availability and full design support capabilities for a new RF Agile Transceiver™ from Analog Devices, Inc. (ADI). The AD9364 is a high-performance, highly-integrated radio frequency (RF) agile transceiver designed for use in 3G and 4G base station applications. The device combines an RF front-end with a flexible mixed-signal baseband section and integrated frequency synthesizers. Richardson RFPD, Inc. announces immediate availability and full design support capabilities for a new absorptive RF single-pole four-throw (SP4T) switch from Peregrine Semiconductor Corporation (Peregrine). The broadband, highly linear PE42442 operates from 450 MHz to 4 GHz and features 61 dB isolation (at 900 MHz), +58 dBm IIP3, and +34 dBm power handling. Richardson RFPD Inc. announces immediate availability and full design support capabilities for a select group of new low-cost products for wireless infrastructure and Aerospace & Defense applications from Skyworks Solutions, Inc. Devices include LNAs with ultra-low noise figures of 0.23 dB, as well as PAs offering 2 W P1 dB and +25 dBm linear Pout, and switches handling up to 150 W input power. Richardson RFPD Inc. announces that it is accepting orders for five new discrete GaN transistors from TriQuint. The new discrete gallium nitride (GaN) on silicon carbide (SiC) high-electron-mobility transistors (HEMTs) offer a range of pulsed output power covering 10 to 285 W, with operating ranges from DC to 6 GHz. Richardson RFPD Inc. announces immediate availability and full design support capabilities for the MDT Series of multilayer ferrite chip power inductors from TOKO. TOKO's proprietary architecture creates extremely robust, magnetically-shielded, multilayer ferrite power inductors offer low resistance and high current handling in miniature footprint, low profile sizes ranging from 2.5 x 2.0 x 1.0 mm to 2.5 x 2.0 x 1.2 mm. Richardson RFPD, Inc. announces availability and full design support capabilities for a large portfolio of high-isolation DC-to-DC converters from RECOM Power, Inc. (RECOM). Designed specifically for insulated-gate bipolar transistor (IGBT) systems, the converters' asymmetric outputs of +15 V and -9 V make them ideal to power IGBT drivers, replacing the need for two converters. Richardson RFPD Inc. announces immediate availability and full design support capabilities for a new 0.2 to 1.0 GHz, N-connectorized low noise amplifier (LNA) from Wavelex. The MAUC-010506 is an integrated up-converter featuring a typical conversion gain of 14 dB, an image rejection of 25 dBc, and 21 dBm third order intercept (IIP3). The device includes an LO doubler, LO buffer amplifier, and RF buffer amplifier. Variable gain can be achieved by adjusting the bias, with turn-down trajectories optimized to maintain linearity and 2xLO leakage over the gain control range. Richardson RFPD Inc. announced availability of the WAT06E precision attenuator. It operates from DC to 6 GHz, with 50 Ohm impedance, with up to 30 dB attenuation, and features 20 W continuous wave (CW) RF power handling and 1.2:1 VSWR. It is ideally suited for wideband power attenuation, high power measurement, high power IP measurement, and RF bench test applications. Richardson RFPD Inc. announces immediate availability and full design support capabilities for a new 3 dB hybrid coupler from Anaren. The low profile, high performance X3C25F1-03S, the latest Femto-sized coupler in the Xinger® III family of products from Anaren, has been miniaturized to a 3 mm x 5 mm footprint without sacrificing electrical performance. Richardson RFPD Inc. announces availability and full design support capabilities for four new 650 V Silicon Carbide (SiC) Schottky diodes from Microsemi Corporation (Microsemi). The new devices are the latest addition to Microsemi's SiC Schottky product family and feature zero recovery time (trr), low forward voltage and low leakage current. They are available in compact footprint packages. Richardson RFPD Inc. announced the launch of its SiC Tech Hub, a micro-website featuring the latest news and new product releases related to Silicon Carbide (SiC) technology. SiC offers significant advantages in high power, high voltage applications where power density, higher performance and reliability are of the utmost importance. Richardson RFPD, Inc. announces immediate availability and full design support capabilities for four new broadband RF gain blocksfrom Analog Devices, Inc. (ADI). The new gain blocks are single-ended RF/IF gain block amplifiers that operate from 30 MHz to 6 GHz and offer up to 24 dB gain and 40 dBm third-order intercept point (OIP3). Richardson RFPD, Inc. announces immediate availability and full design support capabilities for three new surface-mount technology (SMT) high-power attenuators from Anaren. These 30 to 50 W devicesare high-performance; high-power chip attenuators covering from DC to 3.0 GHz and featuring high return loss and small footprints. Richardson RFPD Inc. announces immediate availability and full design support capabilities of the 400Z series of precision tolerance NPO RF and microwave capacitors from American Technical Ceramics Corp. (ATC). They offer best-in-class tolerances over a wide range of capacitance values, as well as low equivalent series resistance (ESR) and high series resonant frequency (FSR). Richardson RFPD, Inc. introduces a new 50 V gallium nitride on silicon carbide (GaN on SiC) RF power high-electron-mobility transistor (HEMT) from Microsemi Corporation (Microsemi). The 0912GN-650V is internally-matched and capable of providing over 17 dB gain, 650 W of pulsed RF output power at 128 μs pulse width and 10% duty factor across the 960 to 1215 MHz band. Richardson RFPD, Inc. announces immediate availability and full design support capabilities for a new absorptive, 50 Ω RF single-pole, double-throw (SPDT) switch from Peregrine Semiconductor Corporation (Peregrine). The PE42423 operates from 100 MHz to 6 GHz and features exceptionally high linearity that remains invariant across the full supply range. Richardson RFPD, Inc. today announces availability and full thermal analysis support for an extensive inventory of extrusion profilesfrom Wakefield-Vette. Richardson RFPD’s offers immediate availability of raw material plus machining capabilities support prototype and pre-production quantity requirements for OEMs. Richardson RFPD, Inc. announces immediate availability and full design support capabilities for two new RF single-pole, double-throw (SPDT) switches from Peregrine Semiconductor Corporation (Peregrine). The PE42520 and PE42521 are pin-compatible upgraded versions of the PE42552, with higher power handling, fast settling time and switching time, and high isolation. Both devices are offered in 3 x 3 mm QFN packages. Richardson RFPD, Inc. announces immediate availability and full design support capabilities for a new 1 W single-pole, double-throw (SPDT) switch from Wavelex. The WSW10180Aoffers wide frequency band operation, from 1.0 to 20.0 GHz, with a low insertion loss of 1.5 dB, power handling of 30 dBm, and 50 nS switching speed. It is versatile for a range of S- to Ku-band applications. Richardson RFPD, Inc. introduces three new low noise amplifiers (WHM0913R, WBA0010A and WMA32C) from WanTcom. The new LNAs integrate WanTcom's proprietary low noise amplifier technologies, high frequency microelectronics assembly techniques, and high reliability design expertise to optimize noise figure, wideband operation, and high performance. Richardson RFPD Inc. announces immediate availability and full design support capabilities for a new high performance GaN power doubler MMIC from TriQuint. The TAT9988 is an ultra-linear, packaged GaN amplifier intended for output stage amplification in CATV infrastructure applications. It features a push-pull cascode design, which provides flat gain along with ultra-low distortion. The 948D Seriesuses a fused, segmented metallization pattern, offering greater open circuit protection, increased reliability, and superior control of capacitance loss than competitive types. The new capacitors are ideally-suited for DC link applications where high bus voltage, high capacitance, and high ripple current are required. Richardson RFPD Inc. announces immediate availability and full design support capabilities for a range of RF MOSFET replacement partsfrom STMicroelectronics (ST). ST's legacy RF MOSFET power transistors represent pin-for-pin replacements for several discontinued products from NXP, including the BLF175, BLF177 and BLF278. Richardson RFPD, Inc. announces immediate availability and full design support capabilities for a new family of circulators and isolatorsfrom Skyworks Solutions, Inc. (Skyworks). The new devices offer high isolation and low insertion loss, cover a broad frequency range (791 to 2710 MHz), and are available in ultra-miniature packages-as small as 11 and 15 mm, without sacrificing performance. Richardson RFPD, Inc. introduces the AirPrime™ SL Series from Sierra Wireless. With programmable capabilities, these wireless modules enable shared processing to reduce the size and cost of the final product. The standard 25 x 30 mm land grid array (LGA) package allows fully automated manufacturing for high-volume production. The SKY67151-396LF is a GaAs, pHEMT low noise amplifier (LNA) with an active bias, high linearity, superior gain, and industry-leading noise figure performance from 0.7 to 3.8 GHz. It features Skyworks' advanced pHEMT enhancement mode process in a compact 2 mm x 2 mm, 8-pin dual flat no-lead (DFN) package. Richardson RFPD Inc. announces immediate availability and full design support capabilities for a new X-Band GaAs LNA from M/A-COM. The MAAL-010528 offers higher gain and linearity performance in the 8.0 to 12.0 GHz band than many competing parts, as well as low noise figure and excellent gain flatness. Richardson RFPD Inc. announces immediate availability and full design support capabilities for two new digital-to-analog converters (DACs)from Analog Devices, Inc. (ADI). The AD9119 and AD9129 are high performance, 11-/14-bit RF DACs that support data rates up to 2.8 GSPS. The devices are based on a quad-switch architecture that enables dual-edge clocking operation. Richardson RFPD Inc. announces immediate availability and full design support capabilities for three new high-performance bulk acoustic wave (BAW) RF bandpass filters from TriQuint. The new BAW bandpass filters offer low insertion loss, high attenuation, greater power handling and temperature stability, and superior signal selectivity, making them ideally-suited for base station, repeaters, and other wireless infrastructure applications. Richardson RFPD Inc. announces immediate availability and full design support capabilities for five new laterally diffused metal oxide semiconductor(LDMOS) power transistors from Freescale Semiconductor, Inc. (Freescale). The new devices are the most recent additions to Freescale's rapidly expanding portfolio of Airfast RF power products, which includes four devicestargeting land mobile radio that are also available from Richardson RFPD. The 1163/BBM2E3KLOis a 20 to 520 MHz amplifier which is guaranteed to deliver 125 W output power and related RF performance under all specified temperature and environmental conditions. It uses high power LDMOS transistors and offers built-in control and monitoring, with protection functions that include non-volatile memory for event recording and factory setup recovery features. Empower RF Systems is delivering units from its “size matters” 1 kW power amplifier portfolio to Richardson RFPD as an integral part of a Test & Measurement promotion that Richardson RFPD is sponsoring on its website. These systems are currently available in the frequency ranges of 20 to 500 MHz, 500 to 1000 MHz, and 20 to 1000 MHz. Richardson RFPD, Inc. announces immediate availability and full design support capabilities of a new Xinger® III 3 dB hybrid coupler from Anaren. The X3C17A1-03WS-CT is the latest addition to Anaren's Xinger III family of surface mount couplers and Doherty combiners designed especially for today’s higher power, more compact, and hotter-running equipment. Richardson RFPD Inc. announces immediate availability and full design support capabilities for a new 18 GHz microwave phase locked loop (PLL) synthesizer from Analog Devices Inc. (ADI). The ADF41020 can be used to implement local oscillators as high as 18 GHz in the up-conversion and down-conversion sections of wireless receivers and transmitters. Richardson RFPD, Inc. announces immediate availability and full design support capabilities for a new dual, 14-bit analog-to-digital converter (ADC) from Analog Devices, Inc. (ADI). The AD9250 is designed to support applications where low cost, small size, wide bandwidth, and versatility are important. Richardson RFPD Inc. announces immediate availability and full design support capabilities for a new dual, 14-bit analog-to-digital converter (ADC) from Analog Devices, Inc. (ADI). The AD9645 includes an on-chip sample-and-hold circuit designed for low cost, low power, small size and ease of use. Richardson RFPD Inc. announces immediate availability and full design support capabilities for a new direct digital synthesizer (DDS) featuring an internal, high speed, high performance, 12-bit digital-to-analog converter (DAC) from Analog Devices Inc. (ADI). The AD9914 is a complete high frequency synthesizer capable of generating a frequency-agile analog sinusoidal waveform (sine wave) at up to 1.4 GHz. Richardson RFPD Inc. announces immediate availability of a new high power amplifier module from Empower RF Systems, Inc. (Empower). The 1163/BBM2E3KLO is a 20 to 520 MHz amplifier which is guaranteed to deliver 125 W output power and related RF performance under all specified temperature and environmental conditions. Richardson RFPD Inc. announces immediate availability and full design support capabilities for a new 30 W (P3dB), DC to 6 GHz, discrete GaN on SiC high electron mobility transistor (HEMT) from TriQuint Semiconductor, Inc. (TriQuint). The T1G6003028-FS is constructed with TriQuint’s 0.25 μm process, which features advanced field plate techniques to optimize power and efficiency at high drain bias operating conditions. Richardson RFPD Inc. announces availability and full design services support for four new liquid cold plate heat sinks from PriaTherm. The four devices are light and compact, offer uniform cooling distribution under mounted power modules, and feature an aluminum alloy Al EN AW 6060 finish. Their brazed design protects against leaks. Richardson RFPD Inc. announces immediate availability and full design support capabilities for three single-pole, double-throw (SPDT) switches designed using the 0.25µm GaN on SiC production process from TriQuint Semiconductor, Inc. (TriQuint). The TGS2351-SM, TGS2352 and TGS2353 switches are ideally-suited for high power switching applications. Richardson RFPD, Inc. announces availability and full design support capabilities for a new family of 1200 V non-punch-through (NPT) insulated-gate bipolar transistors (IGBTs) from Microsemi Corporation (Microsemi). This new generation of IGBTs offers a dramatic reduction of twenty percent, or more, in total switching and conduction losses. Richardson RFPD, Inc. announces availability and full design support capabilities for new metalized polypropylene DC link capacitors from Kendeil™. The two series of devices, designated K31 and K32, are rated for voltages (VDC) ranging from 600 to 1300 V.
Richardson RFPD Inc. announces immediate availability and full design support capabilities for two new converters from Analog Devices Inc. (ADI). The AD5686RBCPZ-RL7 and AD7988-5BRMZRL7 devices are the latest additions to ADI's extensive range of digital-to-analog (DAC) and analog-to-digital (ADC) converters that are designed to meet a broad array of data conversion challenges and applications. Richardson RFPD, Inc. today announces immediate availability and full design support capabilities for a new ½ W RF driver amplifier from Analog Devices, Inc. (ADI). The ADL5324 incorporates a dynamically-adjustable biasing circuit that allows for the customization of OIP3 and P1dB performance from 3.3 V to 5 V, without the need for an external bias resistor. Richardson RFPD Inc. introduces a pair of highly linear and efficient, fully-matched power amplifier modules designed for Picocell, Femtocell, and Customer Premises Equipment (CPE) applications from ANADIGICS Inc. Both devices are designed for WCDMA, HSDPA and LTE downlink air interfaces operating in the 2.11 to 2.17 GHz band. Richardson RFPD, Inc. introduces a new 80 to 105 GHz balanced low noise amplifier (LNA) from United Monolithic Semiconductors S.A.S. (UMS). The CHA1008-99F is a broadband four-stage monolithic LNA designed for millimeter-wave imaging applications, and is also well-suited for commercial digital radios and wireless local area networks (LANs). Richardson RFPD, Inc. today announces immediate availability and full design support capabilities for the newest additions to the family of GaAs pHEMT digital phase shifters from M/A-COM Technology Solutions Inc. (M/A-COM Tech). The MAPS-010145 and MAPS-010165 are, respectively, 4 and 6-bit packaged devices that maintain low phase error and minimal attenuation variation over the full 360 degrees and 3.5-6 GHz frequency range. Richardson RFPD Inc. announces availability and full design support capabilities for a pair of new InGaP HBT amplifiers from Freescale Semiconductor, Inc. The MMZ09312B is a 2-stage high efficiency, Class AB InGaP HBT amplifier that is suitable for applications with frequencies from 400 to 1000 MHz. The MMZ25332B is a high efficiency InGaP HBT amplifier that is suitable for 2400 MHz ISM applications. Richardson RFPD introduces pair of new integrated IQ modulators from ADI with immediate availability and full design support capabilities for a pair of new integrated IQ modulators from Analog Devices, Inc. (ADI). The devices are the latest additions to ADI's range of quadrature modulator and synthesizer solutions that offer small footprints and require minimal external components. Richardson RFPD Inc. announces immediate availability and full design support capabilities for a pair of new converters from Analog Devices, Inc. The AD5760 is a single 16-bit, unbuffered voltage output DAC that operates from a bipolar supply of up to 33 V and the AD9642 is a 14-bit ADC with sampling speeds of 170, 210 or 250 MSPS. Richardson RFPD Inc. announces immediate availability and full design support capabilities for a new ultra-high reliability, 400 W, flanged RF resistor with brazed construction from Anaren. The G400B50W5 offers 50 Ω resistances and can handle 500 K on/off cycles, which is ideal for pulse power applications. Richardson RFPD Inc. announces immediate availability and full design support capabilities for eight devices representing the new gallium nitride (GaN) on Silicon Carbide (SiC) family of power transistors from M/A-COM Technology Solutions, Inc. This product family targets L- and S-Band applications from 960 to 3500 MHz and reinforces M/A-COM Tech's rich heritage of leadership in power hybrid technology. Richardson RFPD Inc. today announces immediate availability and full design support capabilities for a family of easy-to-use, rugged cellular CDMA 1xRTT modems for M2M applications from Maestro Wireless Solutions (Maestro Wireless). The M100CDMA has been certified by regulatory bodies as well as Tier 1 network operators. Richardson RFPD, Inc. announces immediate availability and full design support capabilities for three new RF Surface Acoustic Wave (SAW) filters from TriQuint Semiconductor, Inc. (TriQuint). The high performance filters are ideally-suited for wireless infrastructure applications, including 3G standards. Richardson RFPD Inc. announces immediate availability and full design support capabilities for a new family of GPS modules featuring SiRFstarIV™ GPS technology from Maestro-Wireless Solutions (Maestro Wireless). These modules are offered in flash and ROM memory versions. Richardson RFPD Inc. has announced availability and full design support capabilities for a group of high performance quadrature modulators and demodulators for operation at frequencies up to 2.4 GHz from Analog Devices Inc. (ADI). The devices offer a combination of performance, broadband operating frequency, and flexible device architecture. Richardson RFPD Inc. announces availability and full design support capabilities for a 28-volt, 18 W, GaN on SiC HEMT, RF power transistor from TriQuint Semiconductor. The T1G6001528-Q3 provides 18 W RF output power (P3 dB), with more than 10 dB linear gain, and >60% drain efficiency at 6.0 GHz. Richardson RFPD Inc. announces availability and full design support capabilities for a 28-volt, 55 W, GaN on SiC HEMT, RF power transistor from TriQuint Semiconductor. The T1G4005528-FS provides 55 W RF output power (P3 dB), with greater than 15 dB of linear gain, and better than 50% drain efficiency at 3.5 GHz. Richardson RFPD, Inc. announces off-the-shelf availability for a complete set of key building-block RF amplifiers, each of which has been designed specifically for enhanced performance in demanding applications such as 3G/4G wireless communications systems. The product line is based on advanced semiconductor technologies, including InGaP HBT and Enhanced-Mode GaAs pHEMT (E-pHEMT). Richardson RFPD, Inc. announces immediate availability of four new high-linearity driver amplifiers from TriQuint Semiconductor. These InGaP / GaAs HBT semiconductor devices deliver high performance across a broad range of frequencies. Richardson RFPD announces two new additions to the family of GaAs pHEMT digital phase shifters from M/A-COM Technology Solutions Inc. The MAPS-010146 and MAPS-010166 are, respectively, 4- and 6-bit packaged devices that maintain low phase error and minimal attenuation variation over the full 360-degrees and 8-12 GHz frequency range. Richardson RFPD Inc. announces immediate availability and full design support capabilities for the Xinger®-III line of components from Anaren. These low profile, high performance Xinger-III Doherty combiners are designed particularly for Doherty amplifier applications, where tightly controlled phase and amplitude imbalance as well as low insertion loss are required for maximum and low power condition. Richardson RFPD Inc. announces immediate availability and full design support capabilities for the Xinger®-III line of components from Anaren. The Xinger-III line of 3 dB hybrid and directional couplers are the latest additions to Anaren's popular Xinger-brand of subminiature components for wireless infrastructure applications. The Xinger-III directional couplers are one-fourth the size of the Xinger-II line and offer 37-64% lower insertion loss (down to 0.05 dB). Richardson RFPD Inc. announces availability and full design support capabilities for a series of Enhanced Performance SMA Connectors from Carlisle Interconnect Technologies. The EPSMA (Enhanced Performance) series provides mode free performance to 27 GHz. In addition, the connectors are tuned to provide ultra low VSWR to 27 GHz (typically 1.15:1). A generation ago, easy-to-use GaAs HBT based RF Gain Blocks changed the way RF engineers designed small signal amplifiers. That same evolution is now arriving in GaN technology with simple broadband solutions to medium power requirements in the 5 to 25 Watt range. This power range appears in a wide array of customer requirements, from output stages in broadband land-mobile and military handheld radios, small cell linear finals, to drivers in larger military, EW, and infrastructure power amplifiers. Entering the realm of power amplifiers though obviously brings new requirements and challenges, among them cost, size, power efficiency, and difficult thermal limitations that drive their electrical and package design. This paper will review conventional solutions, explore the tradeoffs between discrete and monolithic MMICs, and highlight the unique benefits of this new hybrid SMT solution. In May 2014, Microsemi entered the RF monolithic microwave integrated circuit market space with a new line of MMICs spanning the DC to 38 GHz frequency range and including wideband amplifier, low noise amplifier and switch devices designed for a broad range of applications. This paper will cover the new line of Microsemi MMICs, including how the highly-differentiated MMIC product attributes lead to faster design cycle times and smaller overall solutions sizes in electronic warfare, signal intelligence, military communications and aerospace applications. This paper offers an overview of Freescale's methodology for thermal measurement of high power RF power amplifiers (RFPAs), including the use of infrared microscopy to accurately determine die temperature at high frequency under RF test conditions, and thermocouple measurements to accurately determine case temperature. It also covers the use of maximum die temperature to calculate a reliable junction-to-case thermal resistance value. A wide range of Freescale's high power RFPAs are available from Richardson RFPD / Arrow RF & Power at www.richardsonrfpd.com. A direct conversion architecture for a receiver is presented in this paper. Direct conversion radios perform just one frequency translation, compared to a superheterodyne receiver that can perform several frequency translations. One frequency translation is advantageous because it reduces receiver complexity and power consumption, it avoids image rejection issues and unwanted mixing products, and it offers high selectivity (ACRR). This paper addresses the use of Wavelex wideband products in test setups for multi-octave and multi-system testing, as well as the advantages of using these wideband products for the testing of narrowband systems. Specific products are presented, along with an example test setup that allows for multi-system testing of ISM 868 MHz, ISM 915 MHz, and avionics transponders at 978 MHz, 1030 MHz, and 1090 MHz, without the need to change components. This paper addresses TriQuint's integrated approach to thermal design that leverages modeling, empirical measurements (including micro-Raman thermography), and finite element analysis (FEA) for high performance microwave GaN HEMT devices and MMICs. This methodology is highly effective and has been empirically validated. By properly addressing FEA boundary condition assumptions and the limitations of infrared microscopy, resulting model calculations are more accurate at both the product and end application level than traditional methods based on lower power density technology. The fast pace, ever changing evolution of the wireless industry puts an enormous time-to-market pressure on the engineering of every new mobile device. Being in the heart of every mobile product, the design of the RF front-end and in particular, the antenna, becomes specially cumbersome as every product currently requires a fully customized antenna. Fractus' new Virtual AntennaTM technology has been conceived to address this particular issue, proposing a new standard antenna element, the miniature mXTENDTM Antenna Booster, to virtually replace every customized antenna in virtually every mobile product. The volume of broadband data transmitted in cable systems has increased tremendously over the last decade. Since 2003, the number of subscribers to broadband data cable services has increased at a compound annual growth rate approaching 14% . The annual growth rate has since slowed, but recent trend information shows double digit growth in premium, so called "wideband" broadband services. To amplify weak signals received by the antenna in communication systems, low noise amplifiers (LNAs) are deployed. LNAs are used in various applications such as GPS receivers, wireless data systems, satellite communications, cellular handsets, radio systems, etc. This paper explains the pulsed RF operation of Microsemi pulsed GaN HEMT RF power transistors using as an example the 1011GN-700ELM 1030 MHz Mode-S Enhanced Message Length (ELM) avionics device. General descriptions are presented detailing both the pulsed gate bias operation and the bias sequencing operation of the “pulser” circuit used on the Microsemi evaluation test fixtures. Doherty combiner product line covers major communication bands ranging from 700 MHz to 2700 MHz. Each model is optimized for the center frequency of targeted frequency band. However, as new spectrum is being released, the preâdesigned standard models can be tuned in customer applications to meet performance. This document provides guidelines to tune these standard models for offâband applications. In RF systems, switches are as common as amplifiers, mixers, and PLLs. While many technologies yield good active RF devices, few yield good RF switches. 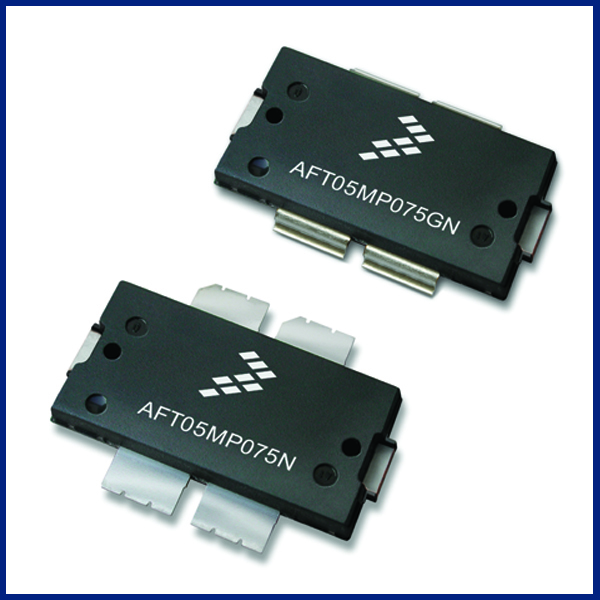 Superior switches are available in Peregrine's UltraCMOS process technology. With today's advancements in wireless technology, greater emphasis is being placed on component performance. This article will provide a discussion of ceramic and porcelain chip capacitors and understanding their behavior in RF product designs. They are an excellent choice for wireless applications where volumetric efficiency, reliability and RF performance are an absolute must. Ever-increasing demands for faster product launch times, higher performance, lower part counts and reduced costs create RF system design challenges. This paper focuses on how the latest gallium nitride (GaN) products, specifically discrete transistors, amplifiers and switches, offer design engineers enhanced flexibility and performance options by reducing RF board space and system prime power requirements. There are several options for the architecture of the transmit signal path. The factors that impact transmit signal elements are introduced, followed by a discussion of the different architectures. Figure 1 shows a direct conversion architecture for an initial point of reference only. Section 6 of 3GPP TS 25.105 describes the transmit signal requirements used throughout this discussion. Radar markets continue to forecast positive growth, and Skyworks Solutions offers a range of products designed specifically for these expanding markets, including materials for phase shifter applications and ferrite circulators. As GaN power device technology matures and gains acceptance suppliers must prove its reliability. This paper will provide an overview of the testing approaches used to establish failure rates and will provide a comparison of DC and RF based HTOL methods. The primary focus of this paper will be the high power RF HTOL test method used by M/A-COM Technology Solutions to qualify its new MAGX line of discrete GaN on SiC RF Power Transistors. Richardson RFPD's interactive Online Product Selector provides quick, easy access to our extensive selection of RF Test and Measurement components, cable assemblies, and accessories from the industry's top brands. Richardson RFPD has been providing products and engineering support to the radio and television broadcast industries for over 60 years. Our RF engineering team can provide design assistance for discrete transmitter designs, integrated (modular) designs,or a combination of both. Richardson RFPD offers the broadest portfolio of RF & Microwave components and solutions for HF to mmWave applications. As a leading RF/Microwave specialist, we also provide design assistance and the engineering expertise necessary to help you select the best Military QPL and COTS components for Aerospace & Defense from the industry's leading manufacturers.